EquityPandit’s analyst predicts range for the week is seen from 3270- 3300 on upside and 2900- 2950 on downside. 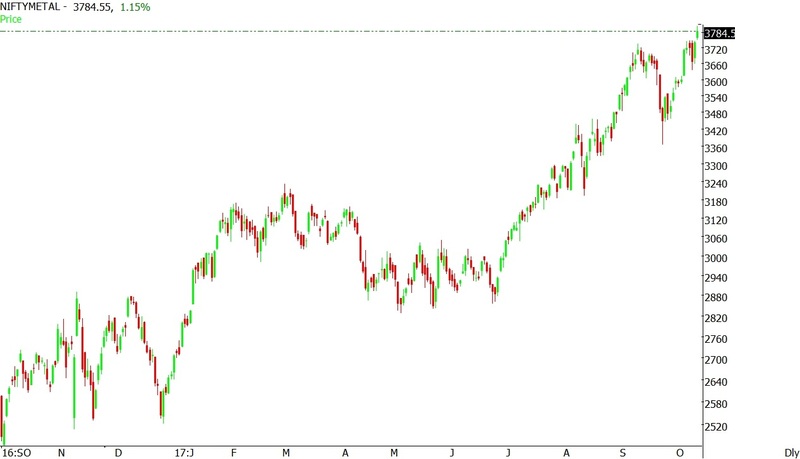 NIFTY METAL Index closed the week on positive note gaining +60.30 Points (+2.05%). NIFTY METAL Index closed the week on positive note gaining 76.35 Points (+2.66%). 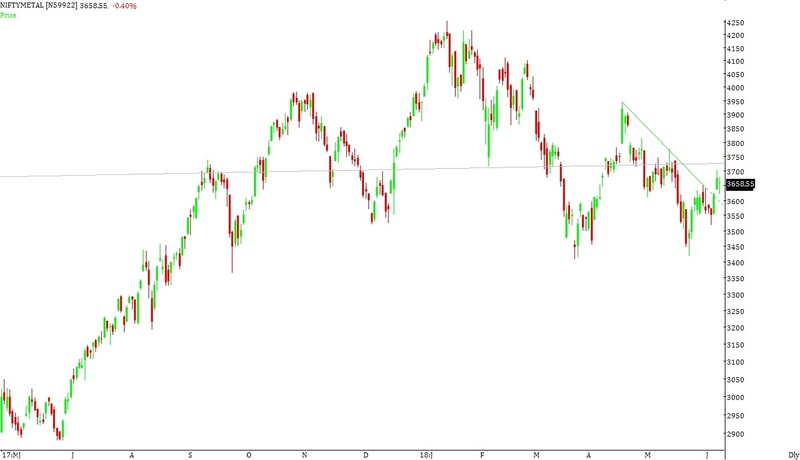 Technically on the daily charts we see minor support on the downside for index lies at 2800-2700 levels, where as minor resistance on the upside is capped around 3200- 3300 levels. Nifty METAL index closed the week on positive note gaining around 2.80%. As we have mentioned last week, that resistance for the index lies in the zone of 2800 to 2850 where long term Fibonacci levels are lying. 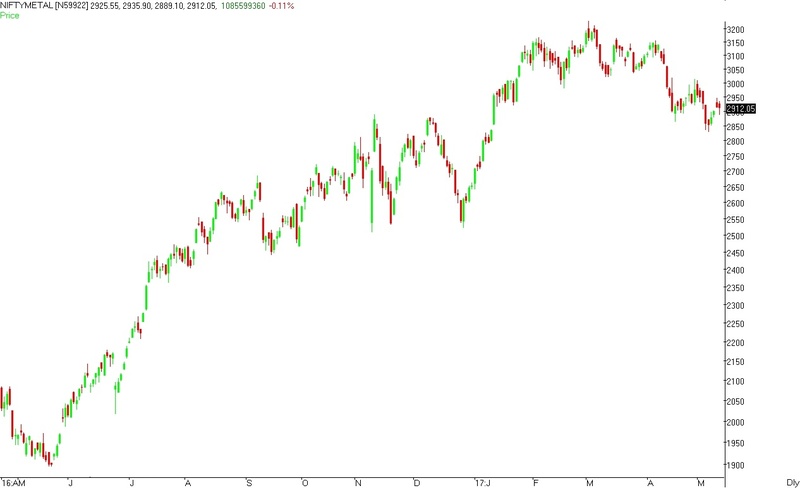 If the index manages close above these levels then the index can move to the levels of 2900 to 2950 from where the index broke down after consolidation and low for the month of December-2018 is lying. During the week the index manages to hit a high of 2926 and close the week around the levels of 2923. Support for index lies around 2800 to 2850 where long term Fibonacci levels are lying. If the index manages to close below these levels then the index can drift to the levels of 2700 to 2750 from where the index broke out of consolidation. 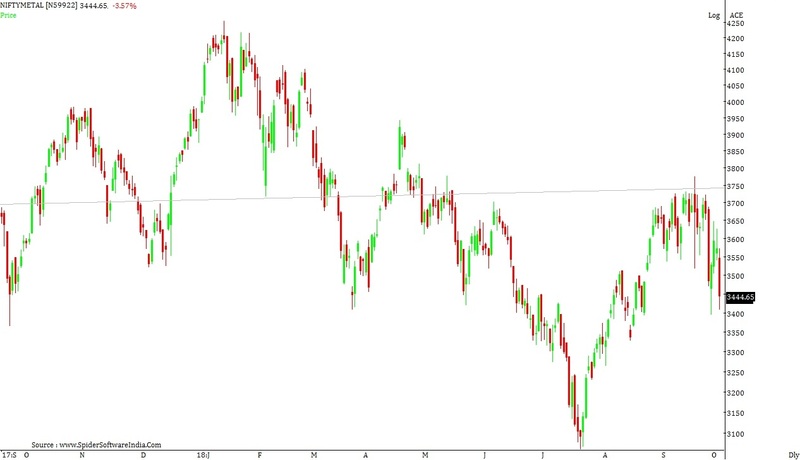 Resistance for the index lies in the zone of 2950 to 3000 from where the index broke down after consolidation and low for the month of December-2018 is lying. If the index manages close above these levels then the index can move to the levels of 3050 to 3100 where Fibonacci levels and medium term moving averages are lying. Nifty METAL index closed the week on positive note gaining around 6.20%. As we have mentioned last week, that support for index lies around 2600 to 2650. If the index manages to close below these levels then the index can witness a free fall to the levels of 2500 to 2550 where long term Fibonacci levels are lying. During the week the index manages to hit a low of 2650 and close the week around the levels of 2842. Minor support for the index lies around 2700 to 2750. 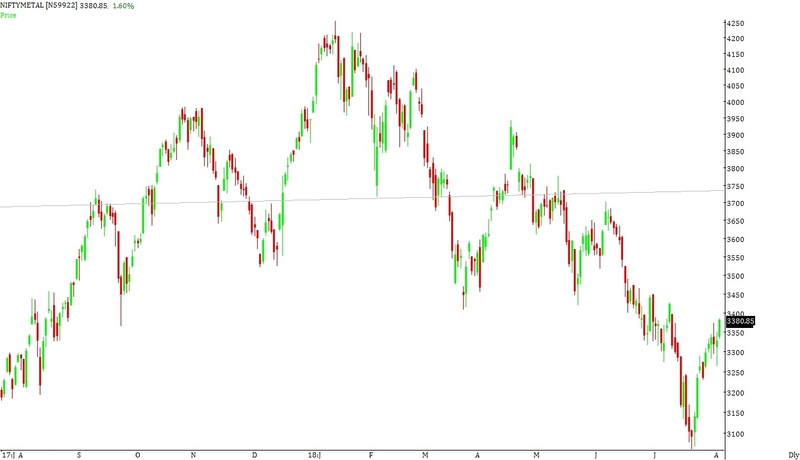 Support for index lies around 2600 to 2650 where the index has formed a double bottom pattern. If the index manages to close below these levels then the index can witness a free fall to the levels of 2500 to 2550 where long term Fibonacci levels are lying. Resistance for the index lies in the zone of 2800 to 2850 where long term Fibonacci levels are lying. 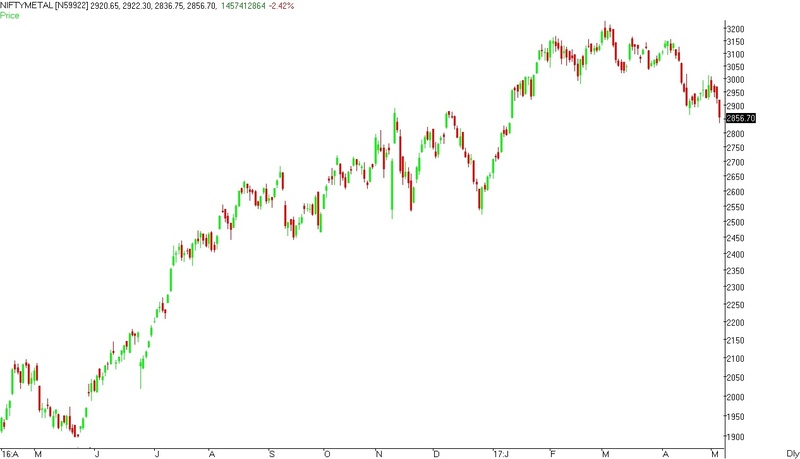 If the index manages close above these levels then the index can move to the levels of 2900 to 2950 from where the index broke down after consolidation and low for the month of December-2018 is lying. Broad range for the index is seen between 2700 to 2750 on downside & 2950 to 3000 on upside. Nifty METAL index closed the week on negative note losing around 2.30%. As we have mentioned last week, that resistance for the index lies in the zone of 2800 to 2850 where long term Fibonacci levels are lying. 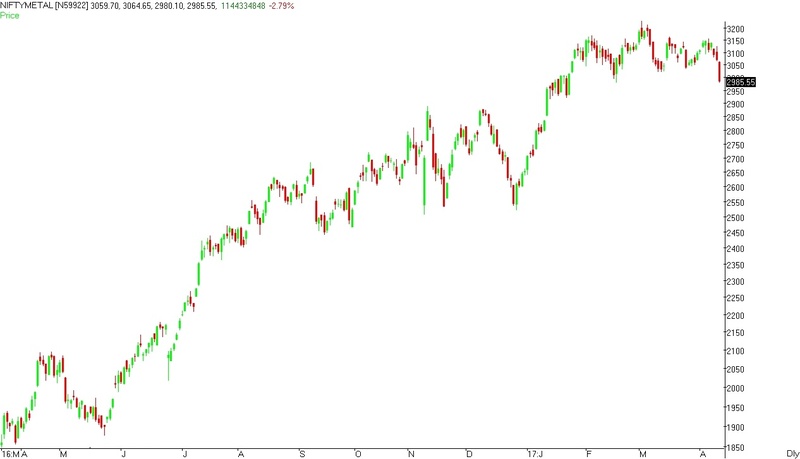 If the index manages close above these levels then the index can move to the levels of 2900 to 2950 from where the index broke down after consolidation and low for the month of December-2018 is lying. During the week the index manages to hit a high of 2805 and close the week around the levels of 2677. 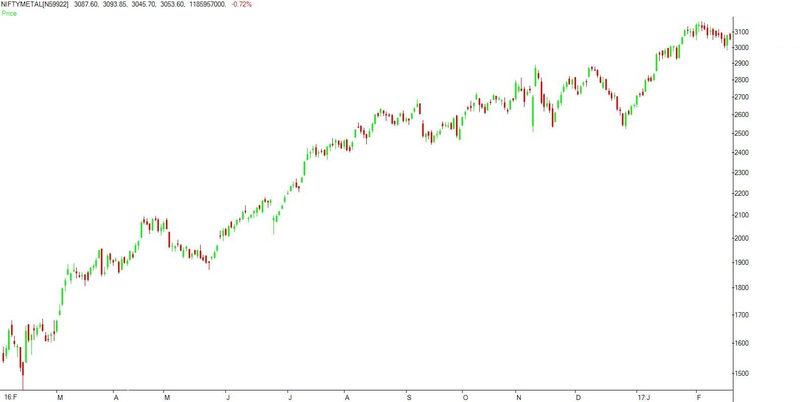 Support for index lies around 2600 to 2650. If the index manages to close below these levels then the index can witness a free fall to the levels of 2500 to 2550 where long term Fibonacci levels are lying. Nifty METAL index closed the week on negative note losing around 2.70%. As we have mentioned last week, that support for the index lies in the zone of 2800 to 2850 where long term Fibonacci levels are lying. If the index manages to close below these levels then the index can witness a freefall and the index can drift to the levels of 2500 to 2550. During the week the index manages to hit a low of 2732 and close the week around the levels of 2741. The index has broken down from the long term support zone of 2800 to 2850. So the index can witness a freefall and the index can drift to the levels of 2500 to 2550. Nifty METAL index closed the week on negative note losing around 1.50%. As we have mentioned last week, that minor resistance for the index lies around 2920 to 2950. Resistance for the index lies in the zone of 3030 to 3080 where Fibonacci levels and short term moving averages are lying. If the index manages close above these levels then the index can move to the levels of 3150 to 3200 where Fibonacci levels and medium term moving averages are lying. During the week the index manages to hit a high of 2920 and close the week around the levels of 2816. Support for the index lies in the zone of 2800 to 2850 where long term Fibonacci levels are lying. If the index manages to close below these levels then the index can witness a freefall and the index can drift to the levels of 2500 to 2550. Minor resistance for the index lies around 2920 to 2950. Resistance for the index lies in the zone of 3030 to 3080 where Fibonacci levels and short term moving averages are lying. If the index manages close above these levels then the index can move to the levels of 3150 to 3200 where Fibonacci levels and medium term moving averages are lying. Nifty METAL index closed the week on negative note losing around 3.40%. As we have mentioned last week, that support for the index lies in the zone of 2850 to 2900 where long term Fibonacci levels are lying. If the index manages to close below these levels then the index can witness a freefall and the index can drift to the levels of 2500 to 2550. During the week the index manages to hit a low of 2847 and close the week around the levels of 2858. Support for the index lies in the zone of 2830 to 2860 where long term Fibonacci levels are lying. If the index manages to close below these levels then the index can witness a freefall and the index can drift to the levels of 2500 to 2550. Nifty METAL index closed the week on negative note losing around 0.50%. As we have mentioned last week, that resistance for the index lies in the zone of 3050 to 3100 where Fibonacci levels are lying. If the index manages close above these levels then the index can move to the levels of 3150 to 3200 where Fibonacci levels and short term moving averages are lying. During the week the index manages to hit a high of 3004 and close the week around the levels of 2957. Support for the index lies in the zone of 2850 to 2900 where long term Fibonacci levels are lying. If the index manages to close below these levels then the index can witness a freefall and the index can drift to the levels of 2500 to 2550. Resistance for the index lies in the zone of 3030 to 3080 where Fibonacci levels are lying. If the index manages close above these levels then the index can move to the levels of 3150 to 3200 where Fibonacci levels and short term moving averages are lying. 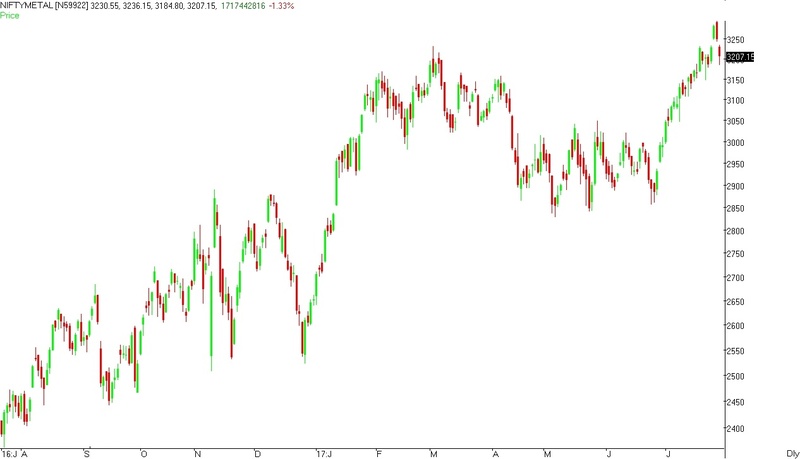 Nifty METAL index closed the week on negative note losing around 1.00%. As we have mentioned last week, that resistance for the index lies in the zone of 3050 to 3100 where Fibonacci levels are lying. If the index manages close above these levels then the index can move to the levels of 3150 to 3200 where Fibonacci levels and short term moving averages are lying. During the week the index manages to hit a high of 3055 and close the week around the levels of 2971. Resistance for the index lies in the zone of 3050 to 3100 where Fibonacci levels are lying. If the index manages close above these levels then the index can move to the levels of 3150 to 3200 where Fibonacci levels and short term moving averages are lying. Nifty METAL index closed the week on negative note losing around 3.50%. As we have mentioned last week, that support for the index lies in the zone of 3050 to 3100 where Fibonacci levels are lying. If the index manages to close below these levels then the index can witness a freefall and the index can drift to the levels of 2850 to 2900. During the week the index manages to hit a low of 2949 and close the week around the levels of 3002. Nifty METAL index closed the week on negative note losing around 1.60%. As we have mentioned last week, that support for the index lies in the zone of 3050 to 3100 where Fibonacci levels are lying. If the index manages to close below these levels then the index can witness a freefall and the index can drift to the levels of 2850 to 2900. During the week the index manages to hit a low of 3050 and close the week around the levels of 3112. Support for the index lies in the zone of 3050 to 3100 where Fibonacci levels are lying. If the index manages to close below these levels then the index can witness a freefall and the index can drift to the levels of 2850 to 2900. Minor resistance for the index lies in the zone of 3200 to 3250. Resistance for the index lies in the zone of 3350 to 3400 where Fibonacci levels and medium term moving averages are lying. If the index manages close above these levels then the index can move to the levels of 3450 to 3500 where Fibonacci levels and long term moving averages are lying. Nifty METAL index closed the week on positive note gaining around 1.60%. As we have mentioned last week, that minor resistance for the index lies in the zone of 3200 to 3250. Resistance for the index lies in the zone of 3350 to 3400 where Fibonacci levels and medium term moving averages are lying. If the index manages close above these levels then the index can move to the levels of 3450 to 3500 where Fibonacci levels and long term moving averages are lying. During the week the index manages to hit a high of 3223 and close the week around the levels of 3162. Nifty METAL index closed the week on positive note gaining around 1.30%. As we have mentioned last week, that support for the index lies in the zone of 3050 to 3100 where the index has taken support in the month of July-2018 and November-2018. 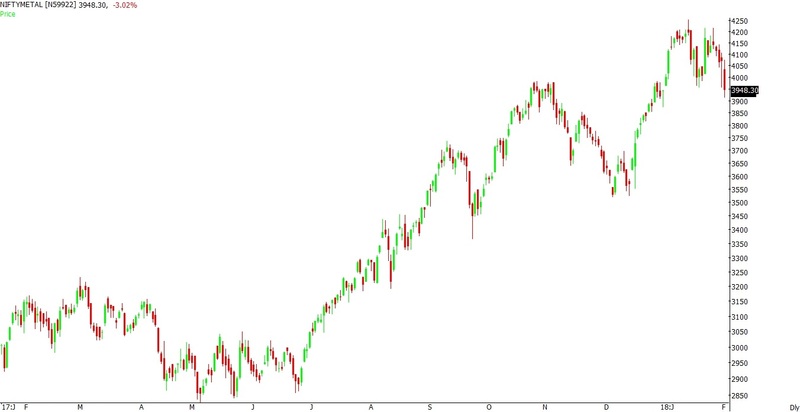 If the index manages to close below these levels then the index can witness a freefall and the index can drift to the levels of 2850 to 2900. During the week the index manages to hit a low of 2985 and close the week around the levels of 3112. Broad range for the index is seen between 2900 to 2950 on downside & 3250 to 3300 on upside. Nifty METAL index closed the week on negative note losing around 2.90%. As we have mentioned last week, that support for the index lies in the zone of 3050 to 3100 where the index has taken support in the month of July-2018 and November-2018. If the index manages to close below these levels then the index can witness a freefall and the index can drift to the levels of 2850 to 2900. During the week the index manages to hit a low of 3042 and close the week around the levels of 3071. Support for the index lies in the zone of 3050 to 3100 where the index has taken support in the month of July-2018 and November-2018. If the index manages to close below these levels then the index can witness a freefall and the index can drift to the levels of 2850 to 2900. Minor resistance for the index lies in the zone of 3200 to 3250. Resistance for the index lies in the zone of 3350 to 3400 where Fibonacci levels and short term moving averages are lying. If the index manages close above these levels then the index can move to the levels of 3450 to 3500 where Fibonacci levels and long term moving averages are lying. As we have mentioned last week, that support for the index lies in the zone of 3150 to 3200 where long term Fibonacci levels are lying. If the index manages to close below these levels then the index can drift to the levels of 3000 to 3050 where the index has taken support in the month of July-2018. During the week the index manages to hit a low of 3092 and close the week around the levels of 3164. Nifty METAL index closed the week on negative note losing around 4.20%. As we have mentioned last week, that minor support for the index lies in the zone of 3350 to 3380. Support for the index lies in the zone of 3150 to 3200 where long term Fibonacci levels are lying. If the index manages to close below these levels then the index can drift to the levels of 3000 to 3050 where the index has taken support in the month of July-2018. During the week the index manages to hit a low of 3208 and close the week around the levels of 3215. Support for the index lies in the zone of 3150 to 3200 where long term Fibonacci levels are lying. If the index manages to close below these levels then the index can drift to the levels of 3000 to 3050 where the index has taken support in the month of July-2018. Minor resistance for the index lies in the zone of 3300 to 3350. Resistance for the index lies in the zone of 3450 to 3500 where Fibonacci levels and medium term moving averages are lying. If the index manages close above these levels then the index can move to the levels of 3550 to 3600 where Fibonacci levels and short & long term moving averages are lying. Nifty METAL index closed the week on negative note losing around 2.20%. As we have mentioned last week, that resistance for the index lies in the zone of 3450 to 3500 where Fibonacci levels and short term moving averages are lying. If the index manages close above these levels then the index can move to the levels of 3550 to 3600 where Fibonacci levels and short & long term moving averages are lying. During the week the index manages to hit a high of 3463 and close the week around the levels of 3355. Minor support for the index lies in the zone of 3350 to 3380. Support for the index lies in the zone of 3150 to 3200 where long term Fibonacci levels are lying. If the index manages to close below these levels then the index can drift to the levels of 3000 to 3050 where the index has taken support in the month of July-2018. Resistance for the index lies in the zone of 3450 to 3500 where Fibonacci levels and medium term moving averages are lying. If the index manages close above these levels then the index can move to the levels of 3550 to 3600 where Fibonacci levels and short & long term moving averages are lying. Broad range for the index is seen between 3200 to 3250 on downside & 3500 to 3550 on upside. Nifty METAL index closed the week on negative note losing around 0.20%. As we have mentioned last week, that resistance for the index lies in the zone of 3400 to 3450 where Fibonacci levels and medium term moving averages are lying. If the index manages close above these levels then the index can move to the levels of 3500 to 3550 where Fibonacci levels and short & long term moving averages are lying. During the week the index manages to hit a high of 3480 and close the week around the levels of 3432. Resistance for the index lies in the zone of 3450 to 3500 where Fibonacci levels and short term moving averages are lying. If the index manages close above these levels then the index can move to the levels of 3550 to 3600 where Fibonacci levels and short & long term moving averages are lying. Broad range for the index is seen between 3200 to 3250 on downside & 3550 to 3600 on upside. 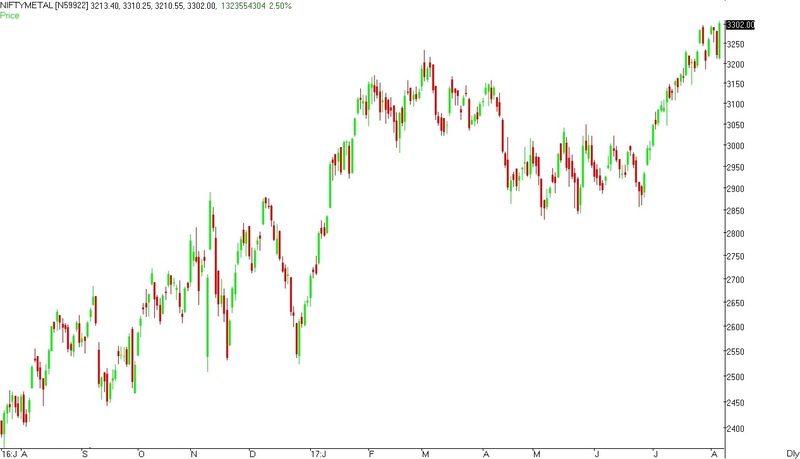 Nifty METAL index closed the week on positive note gaining around . As we have mentioned last week, that minor resistance for the index lies in the zone of 3320 to 3350. Resistance for the index lies in the zone of 3400 to 3450 where Fibonacci levels and medium term moving averages are lying. If the index manages close above these levels then the index can move to the levels of 3500 to 3550 where Fibonacci levels and long term moving averages are lying. During the week the index manages to hit a high of 3470 and close the week around the levels of 3439. Minor support for the index lies in the zone of 3320 to 3350. Support for the index lies in the zone of 3150 to 3200 where long term Fibonacci levels are lying. If the index manages to close below these levels then the index can drift to the levels of 3000 to 3050 where the index has taken support in the month of July-2018. Resistance for the index lies in the zone of 3400 to 3450 where Fibonacci levels and medium term moving averages are lying. If the index manages close above these levels then the index can move to the levels of 3500 to 3550 where Fibonacci levels and short & long term moving averages are lying. Nifty METAL index closed the week on negative note losing around 2.40%. As we have mentioned last week, that support for the index lies in the zone of 3330 to 3380 where Fibonacci levels are lying. If the index manages to close below these levels then the index can drift to the levels of 3250 to 3280 where the index has taken support in the month of August-2018. During the week the index manages to hit a low of 3231 and close the week around the levels of 3284. Minor resistance for the index lies in the zone of 3320 to 3350. Resistance for the index lies in the zone of 3400 to 3450 where Fibonacci levels and medium term moving averages are lying. If the index manages close above these levels then the index can move to the levels of 3500 to 3550 where Fibonacci levels and long term moving averages are lying. 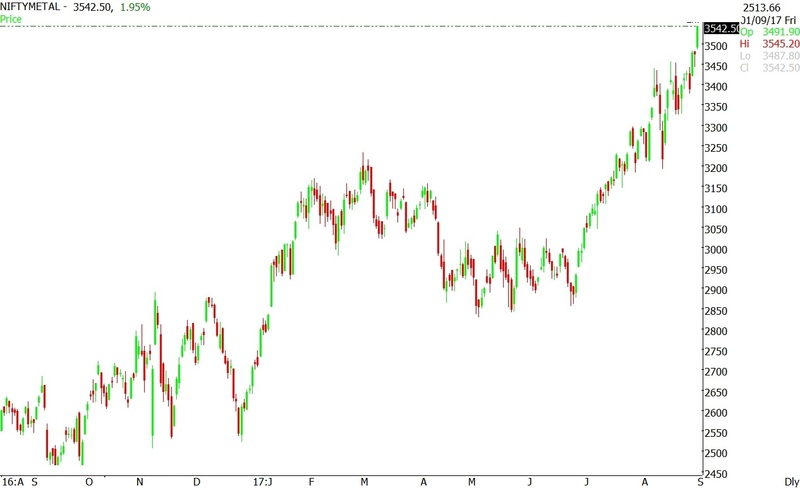 Broad range for the index is seen between 3100 to 3150 on downside & 3400 to 3450 on upside. Nifty METAL index closed the week on negative note losing around 2.10%. As we have mentioned last week, that support for the index lies in the zone of 3350 to 3400 where Fibonacci levels are lying. If the index manages to close below these levels then the index can drift to the levels of 3250 to 3300 where the index has taken support in the month of August-2018. During the week the index manages to hit a low of 3297 and close the week around the levels of 3365. Support for the index lies in the zone of 3330 to 3380 where Fibonacci levels are lying. If the index manages to close below these levels then the index can drift to the levels of 3250 to 3280 where the index has taken support in the month of August-2018. Minor resistance for the index lies in the zone of 3420 to 3450. Resistance for the index lies in the zone of 3500 to 3550 where Fibonacci levels and short term moving averages are lying. If the index manages close above these levels then the index can move to the levels of 3600 to 3650 where Fibonacci levels and long term moving averages are lying. As we have mentioned last week, that support for the index lies in the zone of 3400 to 3450 where Fibonacci levels and short & medium term moving averages are lying. If the index manages to close below these levels then the index can drift to the levels of 3300 to 3350 where the index has taken support in the month of August-2018. During the week the index manages to hit a low of 3235 and close the week around the levels of 3438. Support for the index lies in the zone of 3350 to 3400 where Fibonacci levels are lying. If the index manages to close below these levels then the index can drift to the levels of 3250 to 3300 where the index has taken support in the month of August-2018. Resistance for the index lies in the zone of 3500 to 3550 where Fibonacci levels and short term moving averages are lying. If the index manages close above these levels then the index can move to the levels of 3600 to 3650 where Fibonacci levels and long term moving averages are lying. Broad range for the index is seen between 3250 to 3300 on downside & 3600 to 3650 on upside. Nifty METAL index closed the week on negative note losing around 1.10%. As we have mentioned last week, that support for the index lies in the zone of 3400 to 3450 where Fibonacci levels and short & medium term moving averages are lying. If the index manages to close below these levels then the index can drift to the levels of 3300 to 3350 where the index has taken support in the month of August-2018. During the week the index manages to hit a low of 3396 and close the week around the levels of 3445. Support for the index lies in the zone of 3400 to 3450 where Fibonacci levels and short & medium term moving averages are lying. If the index manages to close below these levels then the index can drift to the levels of 3300 to 3350 where the index has taken support in the month of August-2018. Minor resistance for the index lies around 3520 to 3550. Resistance for the index lies in the zone of 3600 to 3630 where Fibonacci levels are lying. If the index manages close above these levels then the index can move to the levels of 3700 to 3750 where high for the month of September-2018 is lying. Nifty METAL index closed the week on negative note losing around 5.10%. As we have mentioned last week, that minor resistance for the index lies around 3700 to 3730. Resistance for the index lies in the zone of 3800 to 3850 where Fibonacci levels and gap for the index is lying. If the index manages close above these levels then the index can move to the levels of 3900 to 3950 where high for the month of April-2018 is lying. During the week the index manages to hit a high of 3725 and close the week around the levels of 3485. As we have mentioned last week, that minor support for the index lies around 3630 to 3670. Support for the index lies in the zone of 3500 to 3550 where Fibonacci levels are lying. If the index manages to close below these levels then the index can drift to the levels of 3400 to 3450 where Fibonacci levels and short term moving averages are lying. During the week the index manages to hit a low of 3519 and close the week around the levels of 3673. Minor support for the index lies around 3630 to 3670. Support for the index lies in the zone of 3500 to 3550 where Fibonacci levels are lying. If the index manages to close below these levels then the index can drift to the levels of 3400 to 3450 where Fibonacci levels and short term moving averages are lying. Minor resistance for the index lies around 3700 to 3730. Resistance for the index lies in the zone of 3800 to 3850 where Fibonacci levels and gap for the index is lying. If the index manages close above these levels then the index can move to the levels of 3900 to 3950 where high for the month of April-2018 is lying. Broad range for the index is seen between 3500 to 3550 on downside & 3750 to 3800 on upside. Nifty METAL index closed the week on positive note gaining around 0.40%. As we have mentioned last week, that minor support for the index lies around 3600 to 3620. Support for the index lies in the zone of 3500 to 3550 where Fibonacci levels and medium term moving averages are lying. If the index manages to close below these levels then the index can drift to the levels of 3400 to 3450 where Fibonacci levels and short term moving averages are lying. During the week the index manages to hit a low of 3543 and close the week around the levels of 3714. Resistance for the index lies in the zone of 3800 to 3850 where Fibonacci levels and gap for the index is lying. If the index manages close above these levels then the index can move to the levels of 3900 to 3950 where high for the month of April-2018 is lying. Broad range for the index is seen between 3550 to 3600 on downside & 3800 to 3850 on upside. Nifty METAL index closed the week on positive note gaining around 1.50%. As we have mentioned last week, that support for the index lies in the zone of 3500 to 3550 where Fibonacci levels and medium term moving averages are lying. If the index manages to close below these levels then the index can drift to the levels of 3400 to 3450 where Fibonacci levels and short term moving averages are lying. During the week the index manages to hit a low of 3538 and close the week around the levels of 3699. Minor support for the index lies around 3600 to 3620. Support for the index lies in the zone of 3500 to 3550 where Fibonacci levels and medium term moving averages are lying. If the index manages to close below these levels then the index can drift to the levels of 3400 to 3450 where Fibonacci levels and short term moving averages are lying. Resistance for the index lies in the zone of 3680 to 3730 where Fibonacci levels and long term moving averages are lying. If the index manages close above these levels then the index can move to the levels of 3800 to 3850 where Fibonacci levels are lying. Nifty METAL index closed the week on positive note gaining around 4.60%. As we have mentioned last week, that resistance for the index lies in the zone of 3500 to 3550 where Fibonacci levels and medium term moving averages are lying. If the index manages close above these levels then the index can move to the levels of 3650 to 3700 where Fibonacci levels and long term moving averages are lying. During the week the index manages to hit a high of 3687 and close the week around the levels of 3643. Support for the index lies in the zone of 3500 to 3550 where Fibonacci levels and medium term moving averages are lying. If the index manages to close below these levels then the index can drift to the levels of 3400 to 3450 where Fibonacci levels and short term moving averages are lying. Resistance for the index lies in the zone of 3650 to 3700 where Fibonacci levels and long term moving averages are lying. If the index manages close above these levels then the index can move to the levels of 3800 to 3850 where Fibonacci levels are lying. Broad range for the index is seen between 3400 to 3450 on downside & 3800 to 3850 on upside. Nifty METAL index closed the week on positive note gaining around 2.60%. As we have mentioned last week, that minor support for the index lies around 3350 to 3400. Support for the index lies in the zone of 3150 to 3200 from where the index broke out in the month of July-2018. 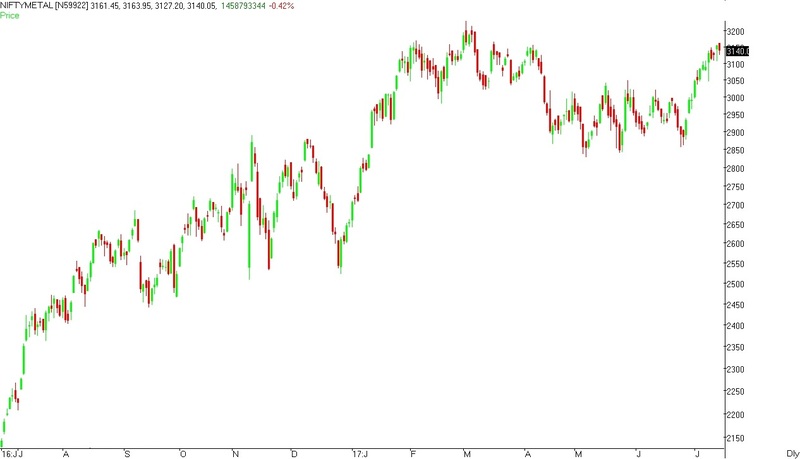 If the index manages to close below these levels then the index can drift to the levels of 3050 to 3100 where the index has formed a bottom in the month of July-2018. During the week the index manages to hit a low of 3394 and close the week around the levels of 3481. Minor support for the index lies around 3380 to 3430. Support for the index lies in the zone of 3200 to 3250 from where the index broke out in the month of July-2018. 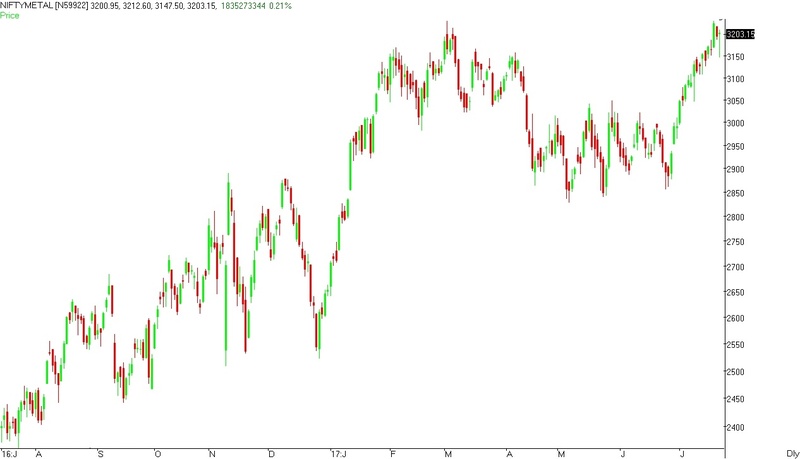 If the index manages to close below these levels then the index can drift to the levels of 3050 to 3100 where the index has formed a bottom in the month of July-2018. Resistance for the index lies in the zone of 3500 to 3550 where Fibonacci levels and medium term moving averages are lying. If the index manages close above these levels then the index can move to the levels of 3650 to 3700 where Fibonacci levels and long term moving averages are lying. 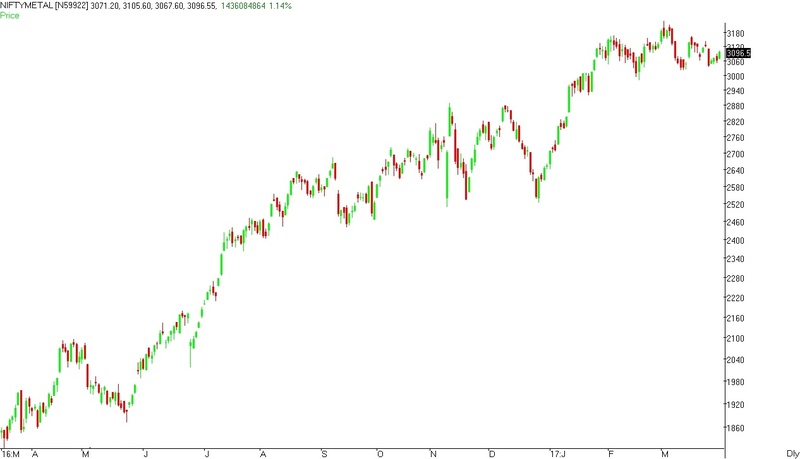 Broad range for the index is seen between 3300 to 3350 on downside & 3600 to 3650 on upside. Nifty METAL index closed the week on negative note losing around 1.20%. As we have mentioned last week, that minor support for the index lies around 3350 to 3400. Support for the index lies in the zone of 3150 to 3200 from where the index broke out in the month of July-2018. If the index manages to close below these levels then the index can drift to the levels of 3050 to 3100 where the index has formed a bottom in the month of July-2018. During the week the index manages to hit a low of 3330 and close the week around the levels of 3394. Minor support for the index lies around 3350 to 3400. Support for the index lies in the zone of 3150 to 3200 from where the index broke out in the month of July-2018. 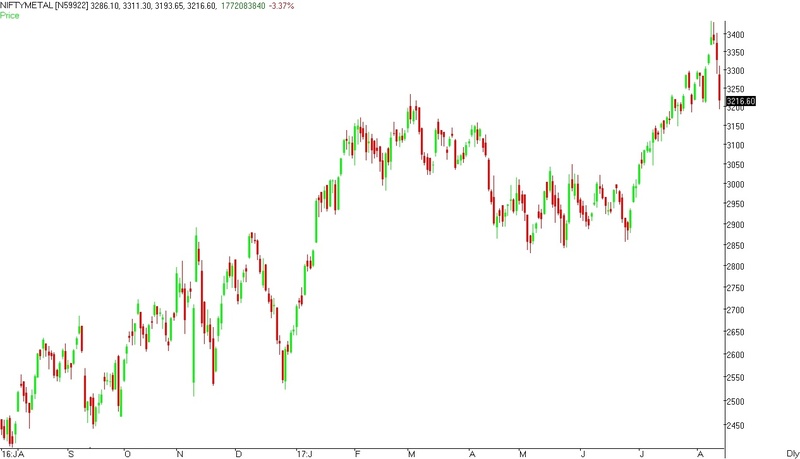 If the index manages to close below these levels then the index can drift to the levels of 3050 to 3100 where the index has formed a bottom in the month of July-2018. Resistance for the index lies in the zone of 3500 to 3550 where Fibonacci levels and medium term moving averages are lying.. If the index manages close above these levels then the index can move to the levels of 3650 to 3700 where Fibonacci levels and long term moving averages are lying. 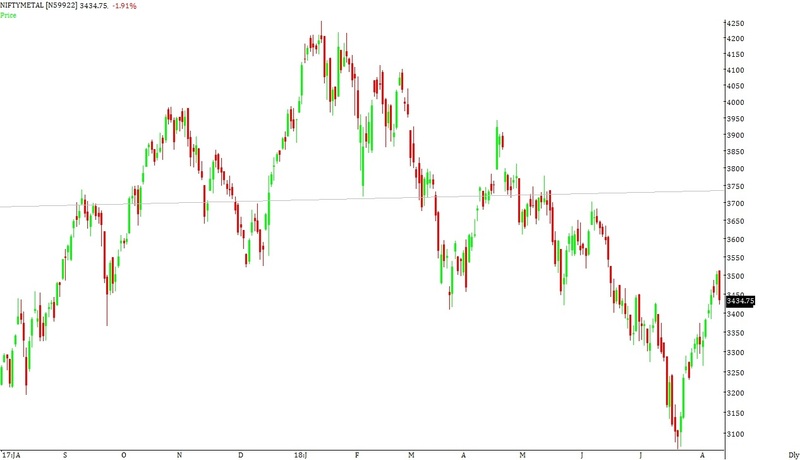 As we have mentioned last week, that resistance for the index lies in the zone of 3400 to 3450 from where the index has broken down from the double bottom pattern and short term moving averages are lying. If the index manages close above these levels then the index can move to the levels of 3550 to 3600 where Fibonacci levels and medium term moving averages are lying. During the week the index manages to hit a high of 3512 and close the week around the levels of 3435. Nifty METAL index closed the week on positive note gaining around 2.50%. 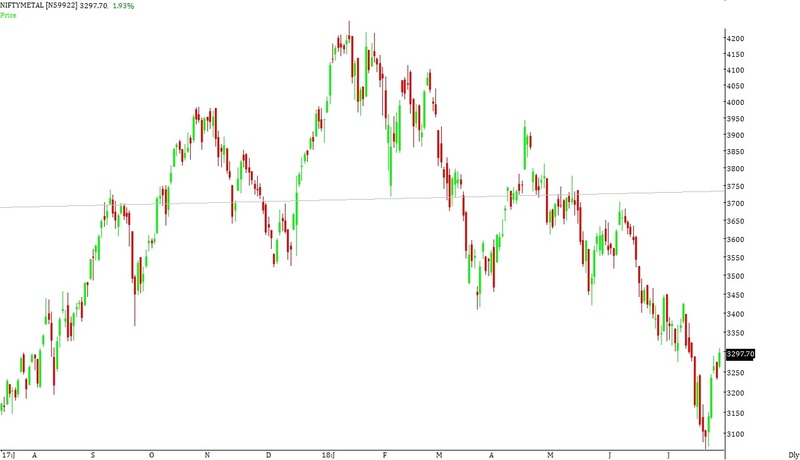 As we have mentioned last week, that resistance for the index lies in the zone of 3400 to 3450 from where the index has broken down from the double bottom pattern and short term moving averages are lying. If the index manages close above these levels then the index can move to the levels of 3550 to 3600 where Fibonacci levels and medium term moving averages are lying. During the week the index manages to hit a high of 3387 and close the week around the levels of 3381. Minor support for the index lies around 3250 to 3300. Support for the index lies in the zone of 3150 to 3200 from where the index broke out in the month of July-2018. 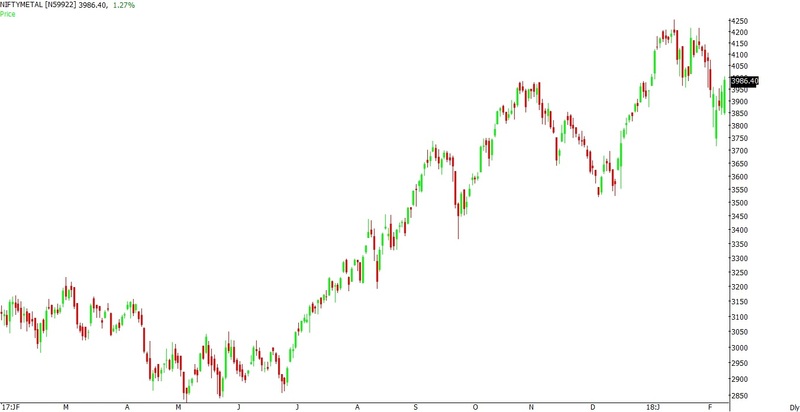 If the index manages to close below these levels then the index can drift to the levels of 3050 to 3100 where the index has formed a bottom in the month of July-2018. 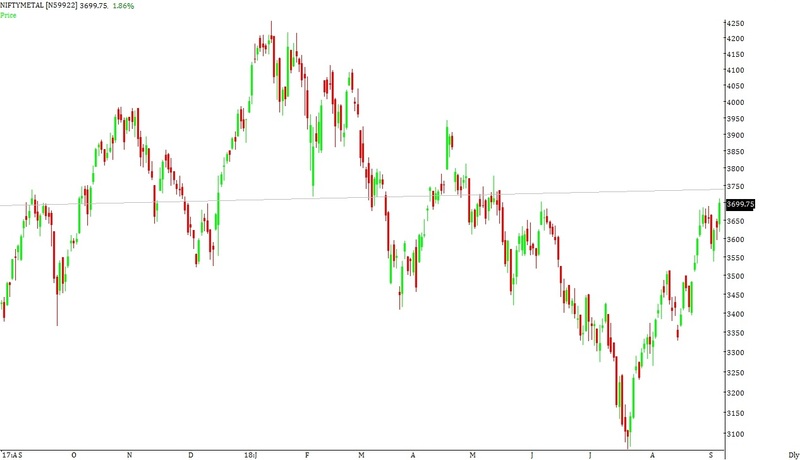 Resistance for the index lies in the zone of 3400 to 3450 from where the index has broken down from the double bottom pattern and short term moving averages are lying. If the index manages close above these levels then the index can move to the levels of 3550 to 3600 where Fibonacci levels and medium term moving averages are lying. Nifty METAL index closed the week on positive note gaining around 6.70%. As we have mentioned last week, that support for the index lies in the zone of 3000 to 3050 from where the index broke out in the month of July-2017. If the index manages to close below these levels then the index can drift to the levels of 2850 to 2900 where long term Fibonacci levels are lying. During the week the index manages to hit a low of 3069 and close the week around the levels of 3298. Minor support for the index lies around 3150 to 3200. Support for the index lies in the zone of 3000 to 3050 from where the index broke out in the month of July-2017. If the index manages to close below these levels then the index can drift to the levels of 2850 to 2900 where long term Fibonacci levels are lying. 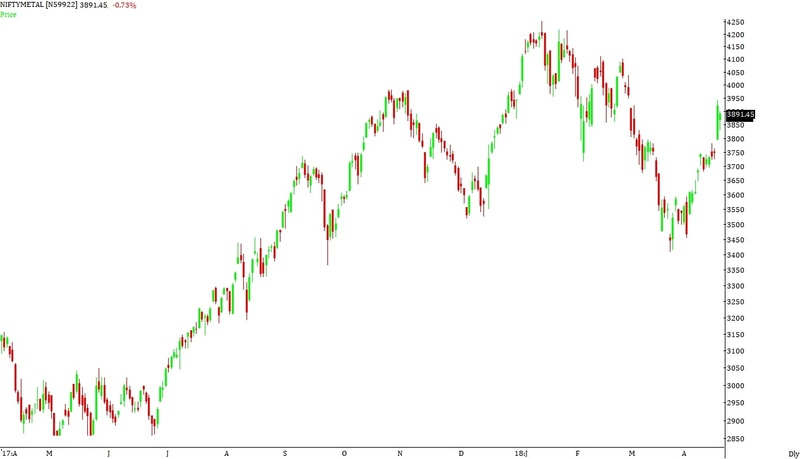 Broad range for the index is seen between 3100 to 3150 on downside & 3550 to 3600 on upside. 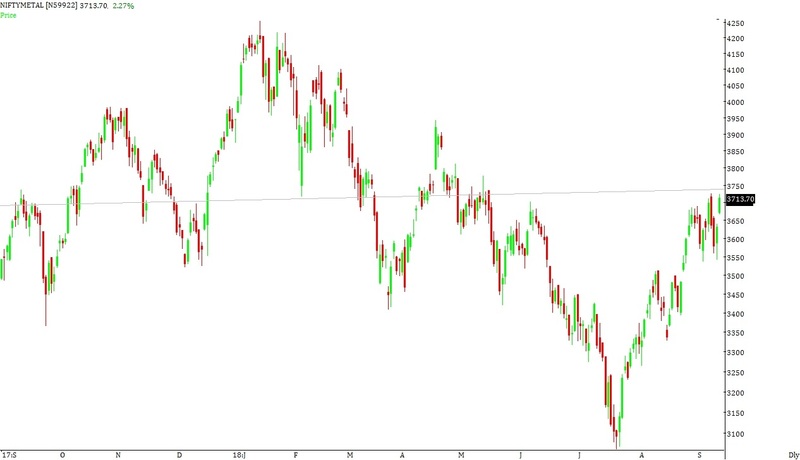 As we have mentioned last week, that resistance for the index lies in the zone of 3400 to 3450 from where the index has broken down from the double bottom pattern. If the index manages close above these levels then the index can move to the levels of 3550 to 3600 where Fibonacci levels are lying. During the week the index manages to hit a high of 3427 and close the week around the levels of 3287. Support for the index lies in the zone of 3200 to 3250 from where the index has broken out in the month of March-2017. If the index manages to close below these levels then the index can drift to the levels of 3000 to 3050 from where the index broke out in the month of July-2017. 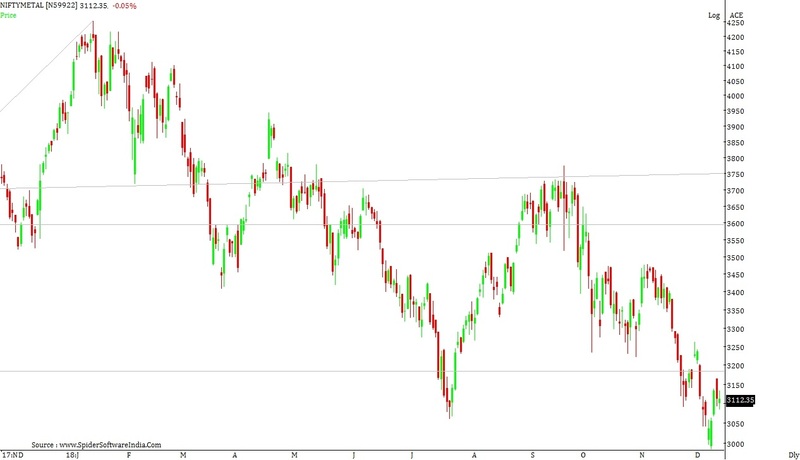 Resistance for the index lies in the zone of 3400 to 3450 from where the index has broken down from the double bottom pattern. If the index manages close above these levels then the index can move to the levels of 3550 to 3600 where Fibonacci levels are lying. 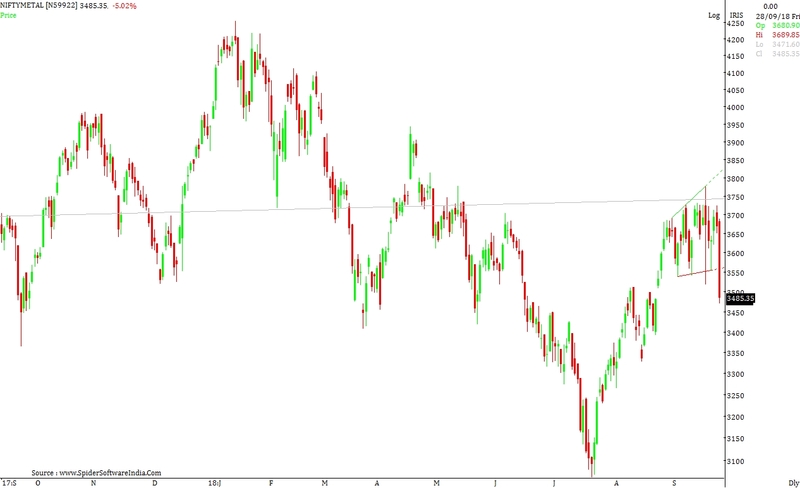 Broad range for the index is seen between 3150 to 3200 on downside & 3400 to 3450 on upside. As we have mentioned last week, that support for the index lies in the zone of 3400 to 3450 where the index has taken support in the month of March-2018 and May-2018. If the index manages to close below these levels then the index can drift to the levels of 3200 to 3250 from where the index has broken out in the month of March-2017. During the week the index manages to hit a low of 3275 and close the week around the levels of 3322. Broad range for the index is seen between 3200 to 3250 on downside & 3450 to 3500 on upside. Nifty METAL index closed the week on positive note gaining around 0.30%. As we have mentioned last week, that support for the index lies in the zone of 3400 to 3450 where the index has taken support in the month of March-2018 and May-2018. If the index manages to close below these levels then the index can drift to the levels of 3200 to 3250 from where the index has broken out in the month of March-2017. During the week the index manages to hit a low of 3318 and close the week around the levels of 3440. Support for the index lies in the zone of 3400 to 3450 where the index has taken support in the month of March-2018 and May-2018. If the index manages to close below these levels then the index can drift to the levels of 3200 to 3250 from where the index has broken out in the month of March-2017. Resistance for the index lies in the zone of 3550 to 3600 where Fibonacci levels are lying. If the index manages close above these levels then the index can move to the levels of 3730 to 3750 where Fibonacci levels and long term moving averages are lying. Broad range for the index is seen between 3300 to 3330 on downside & 3600 to 3650 on upside. Nifty METAL index closed the week on negative note losing around 3.10%. As we have mentioned last week, that support for the index lies in the zone of 3420 to 3470 where the index has taken support in the month of March-2018 and May-2018. If the index manages to close below these levels then the index can drift to the levels of 3200 to 3250 from where the index has broken out in the month of March-2017. During the week the index manages to hit a low of 3398 and close the week around the levels of 3432. Nifty METAL index closed the week on negative note losing around 3.20%. As we have mentioned last week, that support for the index lies in the zone of 3580 to 3610 where break out levels and Fibonacci levels are lying. 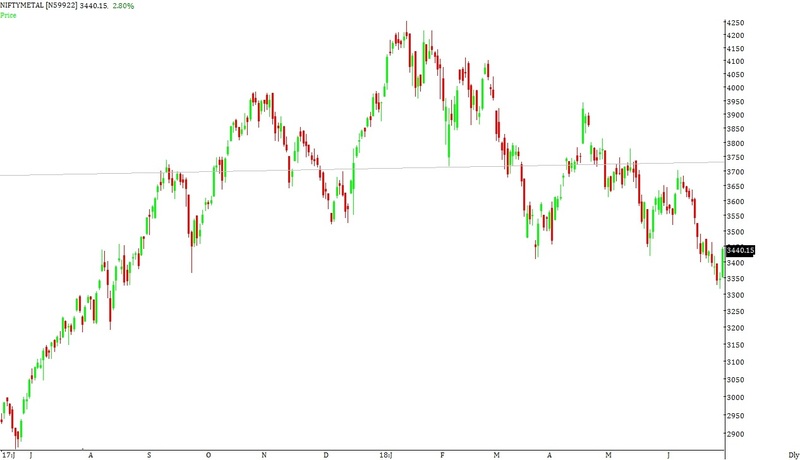 If the index manages to close below these levels then the index can drift to the levels of 3420 to 3470 where the index has taken support in the month of March-2018 and May-2018. During the week the index manages to hit a low of 3523 and close the week around the levels of 3542. Support for the index lies in the zone of 3420 to 3470 where the index has taken support in the month of March-2018 and May-2018. If the index manages to close below these levels then the index can drift to the levels of 3200 to 3250 from where the index has broken out in the month of March-2017. Resistance for the index lies in the zone of 3600 to 3630 where Fibonacci levels are lying. If the index manages close above these levels then the index can move to the levels of 3730 to 3750 where Fibonacci levels and long term moving averages are lying. Broad range for the index is seen between 3400 to 3430 on downside & 3700 to 3750 on upside. As we have mentioned last week, that minor resistance for the index lies in the zone of 3630 to 3650. Resistance for the index lies in the zone of 3750 to 3800 where Fibonacci levels and long term moving averages are lying. If the index manages close above these levels then the index can move to the levels of 3850 to 3900 where Fibonacci levels and medium term moving averages are lying. During the week the index manages to hit a high of 3705 and close the week around the levels of 3659. Support for the index lies in the zone of 3580 to 3610 where break out levels and Fibonacci levels are lying. 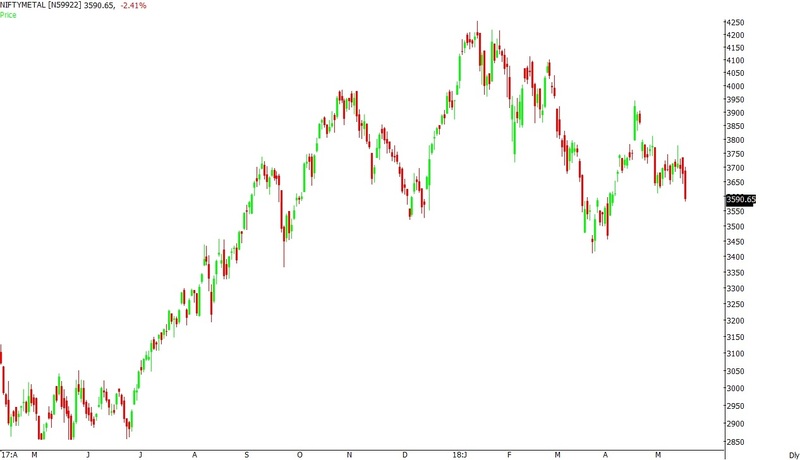 If the index manages to close below these levels then the index can drift to the levels of 3420 to 3470 where the index has taken support in the month of March-2018 and May-2018. Resistance for the index lies in the zone of 3730 to 3780 where Fibonacci levels and long term moving averages are lying. If the index manages close above these levels then the index can move to the levels of 3850 to 3900 where Fibonacci levels are lying. Broad range for the index is seen between 3450 to 3500 on downside & 3800 to 3850 on upside. 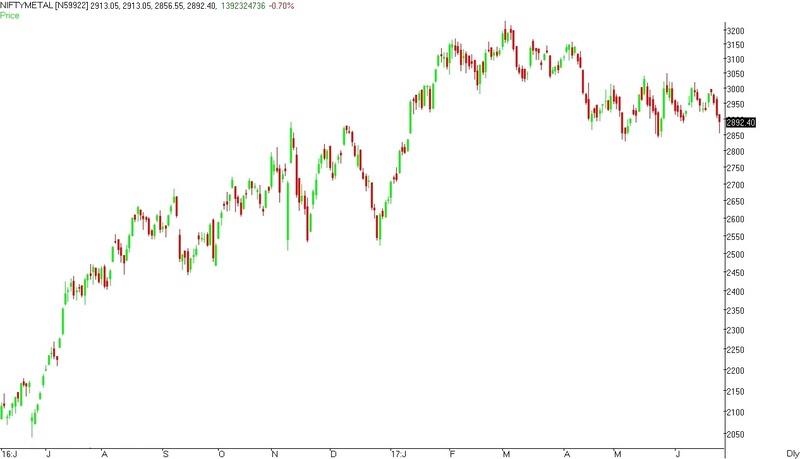 Nifty METAL index closed the week on absolutely flat note. As we have mentioned last week, that support for the index lies in the zone of 3550 to 3580 where break out levels and Fibonacci levels are lying. If the index manages to close below these levels then the index can drift to the levels of 3400 to 3450 where the index has taken support in the month of March-2018. During the week the index manages to hit a low of 3552 and close the week around the levels of 3568. Support for the index lies in the zone of 3550 to 3580 where break out levels and Fibonacci levels are lying. If the index manages to close below these levels then the index can drift to the levels of 3400 to 3450 where the index has taken support in the month of March-2018. Minor resistance for the index lies in the zone of 3630 to 3650. Resistance for the index lies in the zone of 3750 to 3800 where Fibonacci levels and long term moving averages are lying. If the index manages close above these levels then the index can move to the levels of 3850 to 3900 where Fibonacci levels and medium term moving averages are lying. Broad range for the index is seen between 3400 to 3450 on downside & 3700 to 3750 on upside. Nifty METAL index closed the week on negative note losing around 0.70%. As we have mentioned last week, that support for the index lies in the zone of 3575 to 3625 where break out levels and Fibonacci levels are lying. If the index manages to close below these levels then the index can drift to the levels of 3400 to 3450 where the index has taken support in the month of March-2018. During the week the index manages to hit a low of 3420 and close the week around the levels of 3567. Nifty METAL index closed the week on negative note losing around 3.30%. As we have mentioned last week, that resistance for the index lies in the zone of 3750 to 3800 where Fibonacci levels and long term moving averages are lying. If the index manages close above these levels then the index can move to the levels of 3850 to 3900 where Fibonacci levels and medium term moving averages are lying. During the week the index manages to hit a high of 3779 and close the week around the levels of 3591. Support for the index lies in the zone of 3575 to 3625 where break out levels and Fibonacci levels are lying. If the index manages to close below these levels then the index can drift to the levels of 3400 to 3450 where the index has taken support in the month of March-2018. Minor resistance for the index lies in the zone of 3640 to 3660. Resistance for the index lies in the zone of 3750 to 3800 where Fibonacci levels and long term moving averages are lying. If the index manages close above these levels then the index can move to the levels of 3850 to 3900 where Fibonacci levels and medium term moving averages are lying. Broad range for the index is seen between 3450 to 3500 on downside & 3750 to 3800 on upside. Nifty METAL index closed the week on positive note gaining around 2.20%. As we have mentioned last week, that resistance for the index lies in the zone of 3700 to 3750 where Fibonacci levels and long term moving averages are lying. If the index manages close above these levels then the index can move to the levels of 3800 to 3850 where Fibonacci levels and medium term moving averages are lying. During the week the index manages to hit a high of 3747 and close the week around the levels of 3713. Resistance for the index lies in the zone of 3750 to 3800 where Fibonacci levels and long term moving averages are lying. If the index manages close above these levels then the index can move to the levels of 3850 to 3900 where Fibonacci levels and medium term moving averages are lying. Broad range for the index is seen between 3500 to 3550 on downside & 3850 to 3900 on upside. As we have mentioned last week, that support for the index lies in the zone of 3700 to 3750 where Fibonacci levels and long term moving averages are lying. If the index manages to close below these levels then the index can drift to the levels of 3575 to 3625 where break out levels and Fibonacci levels are lying. During the week the index manages to hit a low of 3611 and close the week around the levels of 3634. Resistance for the index lies in the zone of 3700 to 3750 where Fibonacci levels and long term moving averages are lying. If the index manages close above these levels then the index can move to the levels of 3800 to 3850 where Fibonacci levels and medium term moving averages are lying. Broad range for the index is seen between 3400 to 3450 on downside & 3750 to 3800 on upside. As we have mentioned last week, that support for the index lies in the zone of 3800 to 3850 where Fibonacci levels and short & medium term moving averages are lying. If the index manages to close below these levels then the index can drift to the levels of 3700 to 3750 where Fibonacci levels and long term moving averages are lying. During the week the index manages to hit a low of 3715 and close the week around the levels of 3764. Support for the index lies in the zone of 3700 to 3750 where Fibonacci levels and long term moving averages are lying. If the index manages to close below these levels then the index can drift to the levels of 3575 to 3625 where break out levels and Fibonacci levels are lying. Resistance for the index lies in the zone of 3800 to 3850 where Fibonacci levels and medium term moving averages are lying. If the index manages close above these levels then the index can move to the levels of 3950 to 4000 Fibonacci levels are lying. Broad range for the index is seen between 3550 to 3600 on downside & 3950 to 4000 on upside. Nifty METAL index closed the week on positive note gaining around 4.50%. 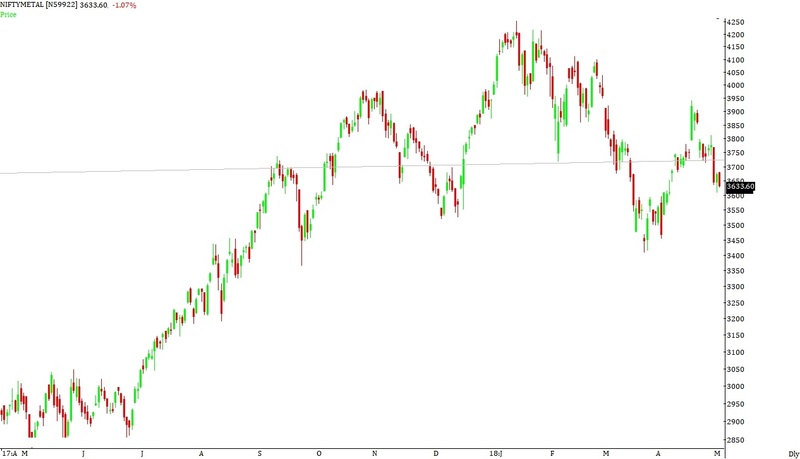 As we have mentioned last week, that resistance for the index lies in the zone of 3700 to 3750 from where the index broke down from February-2018 lows. If the index manages close above these levels then the index can move to the levels of 3800 to 3850 where Fibonacci levels and short & medium term moving averages are lying. During the week the index manages to hit a high of 3944 and close the week around the levels of 3891. Support for the index lies in the zone of 3800 to 3850 where Fibonacci levels and short & medium term moving averages are lying. If the index manages to close below these levels then the index can drift to the levels of 3700 to 3750 where Fibonacci levels and long term moving averages are lying. Resistance for the index lies in the zone of 3950 to 4000 Fibonacci levels are lying. 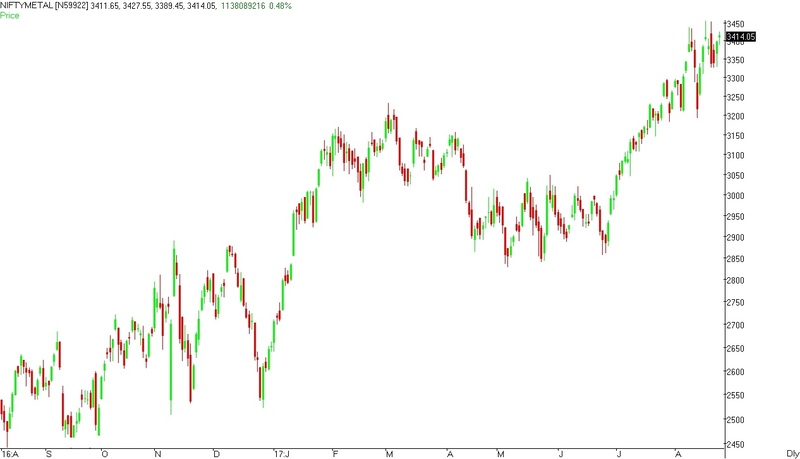 If the index manages close above these levels then the index can move to the levels of 4100 to 4130 where the index has formed a double top in the month of February-2018. Broad range for the index is seen between 3650 to 3700 on downside & 4050 to 4100 on upside. Nifty METAL index closed the week on positive note gaining around 3.30%. As we have mentioned last week, that resistance for the index lies in the zone of 3600 to 3650 where Fibonacci levels and long term moving averages are lying. 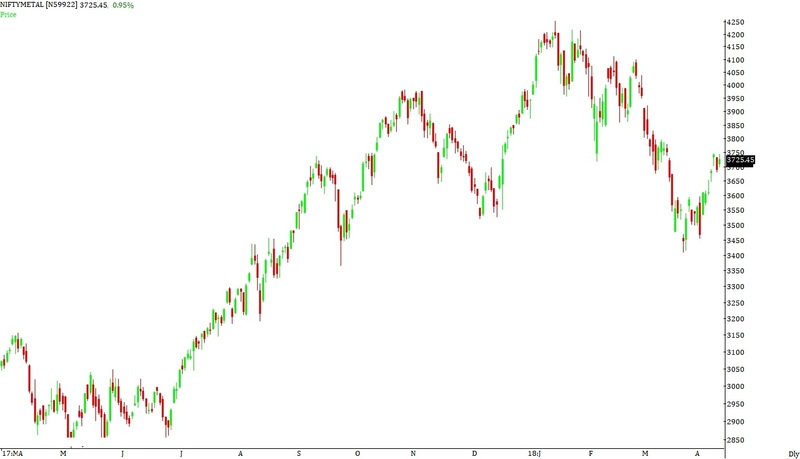 If the index manages close above these levels then the index can move to the levels of 3700 to 3750 from where the index broke down from February-2018 lows. During the week the index manages to hit a high of 3748 and close the week around the levels of 3725. Support for the index lies in the zone of 3600 to 3650 where Fibonacci levels and long term moving averages are lying. If the index manages to close below these levels then the index can drift to the levels of 3500 to 3550 from where the index broke out. 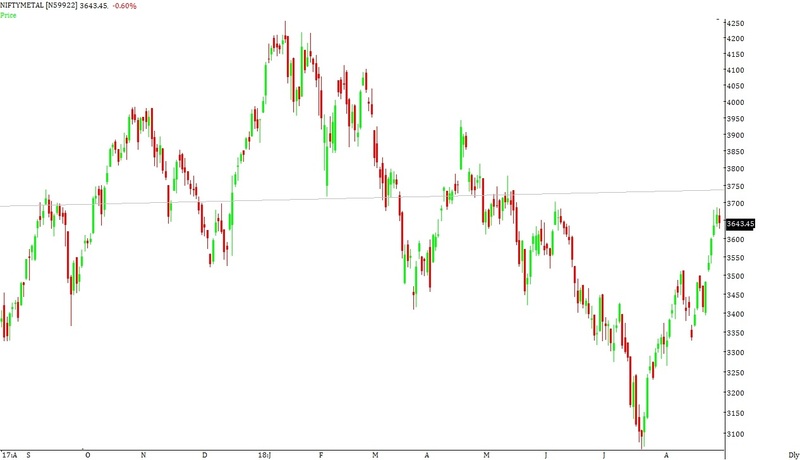 Resistance for the index lies in the zone of 3700 to 3750 from where the index broke down from February-2018 lows. If the index manages close above these levels then the index can move to the levels of 3800 to 3850 where Fibonacci levels and short & medium term moving averages are lying. Broad range for the index is seen between 3550 to 3600 on downside & 3850 to 3900 on upside. Nifty METAL index closed the week on positive note gaining around 2.30%. As we have mentioned last week, that resistance for the index lies in the zone of 3550 to 3600 where Fibonacci levels and long term moving averages are lying. 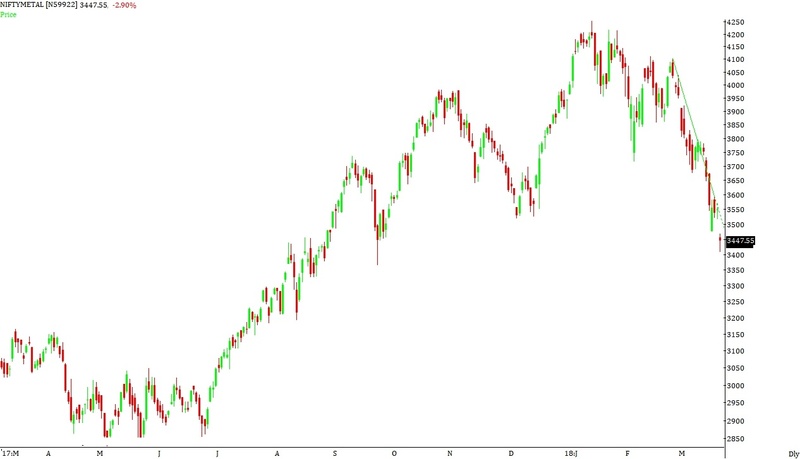 If the index manages close above these levels then the index can move to the levels of 3700 to 3750 from where the index broke down from February-2018 lows. During the week the index manages to hit a high of 3614 and close the week around the levels of 3593. Minor support for the index lies in the zone of 3500 to 3550. Support for the index lies in the zone of 3350 to 3400 where the index has taken support in the month of September-2017 and lows for the month of March-2018 are lying. 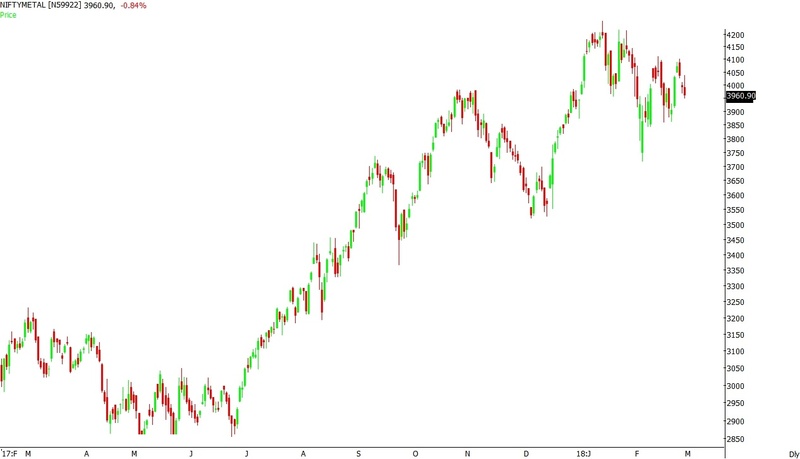 If the index manages to close below these levels then the index can drift to the levels of 3200 to 3250 from where the index broke out from March-2017 highs. Resistance for the index lies in the zone of 3600 to 3650 where Fibonacci levels and long term moving averages are lying. 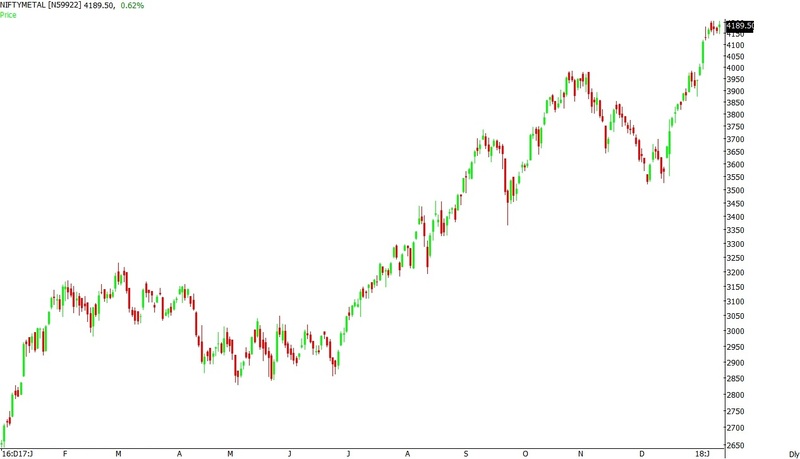 If the index manages close above these levels then the index can move to the levels of 3700 to 3750 from where the index broke down from February-2018 lows. Nifty METAL index closed the week on positive note gaining around 1.90%. As we have mentioned last week, that resistance for the index lies in the zone of 3550 to 3600 where break out levels and long term moving averages are lying. 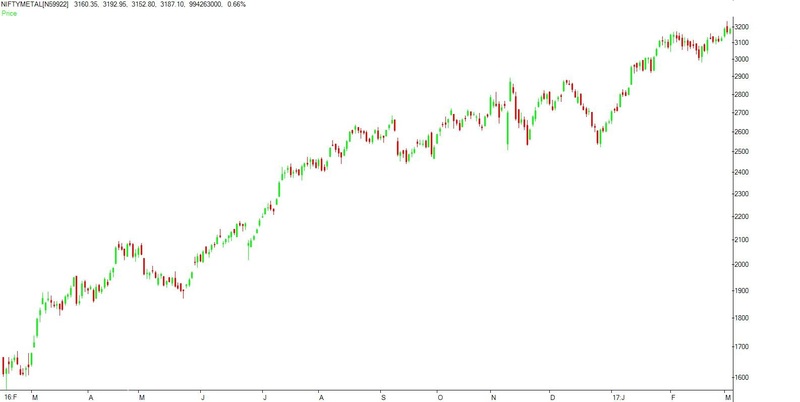 If the index manages close above these levels then the index can move to the levels of 3700 to 3750 from where the index broke down from February-2018 lows. During the week the index manages to hit a high of 3595 and close the week around the levels of 3513. Support for the index lies in the zone of 3350 to 3400 where the index has taken support in the month of September-2017 and lows for the month of March-2018 are lying. If the index manages to close below these levels then the index can drift to the levels of 3200 to 3250 from where the index broke out from March-2017 highs. Resistance for the index lies in the zone of 3550 to 3600 where Fibonacci levels and long term moving averages are lying. 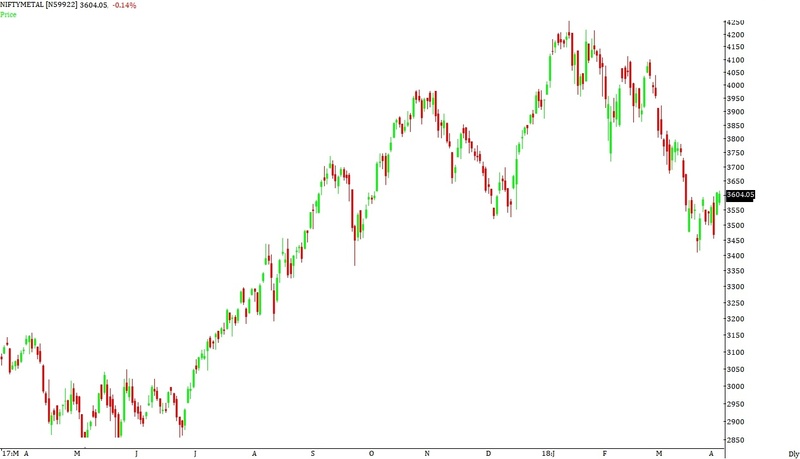 If the index manages close above these levels then the index can move to the levels of 3700 to 3750 from where the index broke down from February-2018 lows. 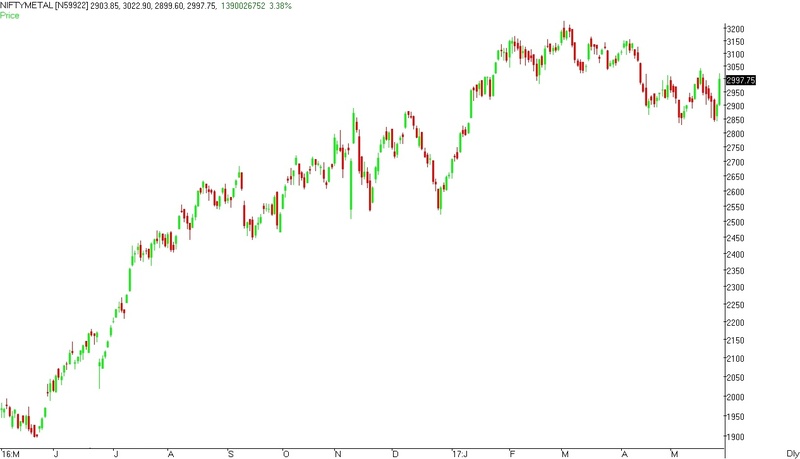 Broad range for the index is seen between 3300 to 3350 on downside & 3700 to 3750 on upside. As we have mentioned last week, that support for the index lies in the zone of 3550 to 3600 where break out levels and long term moving averages are lying. If the index manages to close below these levels then the index can drift to the levels of 3350 to 3400 where the index has taken support in the month of September-2017. During the week the index manages to hit a low of 3410 and close the week around the levels of 3448. Support for the index lies in the zone of 3350 to 3400 where the index has taken support in the month of September-2017. If the index manages to close below these levels then the index can drift to the levels of 3200 to 3250 from where the index broke out from March-2017 highs. Resistance for the index lies in the zone of 3550 to 3600 where break out levels and long term moving averages are lying. 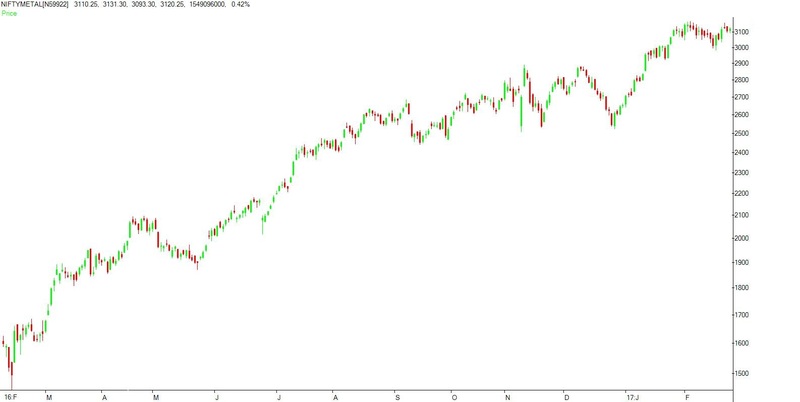 If the index manages close above these levels then the index can move to the levels of 3700 to 3750 from where the index broke down from February-2018 lows. Broad range for the index is seen between 3200 to 3250 on downside & 3650 to 3700 on upside. Nifty METAL index closed the week on negative note losing around 6.90%. As we have mentioned last week, that support for the index lies in the zone of 3850 to 3900 where break out levels and medium term moving averages are lying. If the index manages to close below these levels then the index can drift to the levels of 3550 to 3600 where break out levels and long term moving averages are lying. During the week the index manages to hit a low of 3678 and close the week around the levels of 3688. Support for the index lies in the zone of 3550 to 3600 where break out levels and long term moving averages are lying. If the index manages to close below these levels then the index can drift to the levels of 3350 to 3400 where the index has taken support in the month of September-2017. Minor resistance for the index lies in the zone of 3780 to 3820. Resistance for the index lies in the zone of 3900 to 3950 where medium term moving averages are lying. If the index manages close above these levels then the index can move to the levels of 4050 to 4100 where break down levels are lying. Nifty METAL index closed the week on negative note losing around 1.70%. As we have mentioned last week, that resistance for the index lies in the zone of 4050 to 4100 where break down levels are lying. 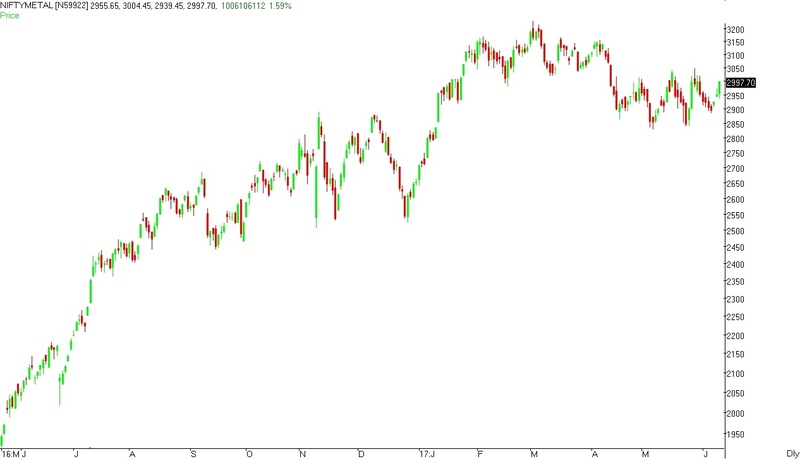 If the index manages close above these levels then the index can move to the levels of 4200 to 4250 where the index has formed a high in the month of January-2018. During the week the index manages to hit a high of 4102 and close the week around the levels of 3961. Support for the index lies in the zone of 3850 to 3900 where break out levels and medium term moving averages are lying. If the index manages to close below these levels then the index can drift to the levels of 3550 to 3600 where break out levels and long term moving averages are lying. Resistance for the index lies in the zone of 4050 to 4100 where break down levels are lying. 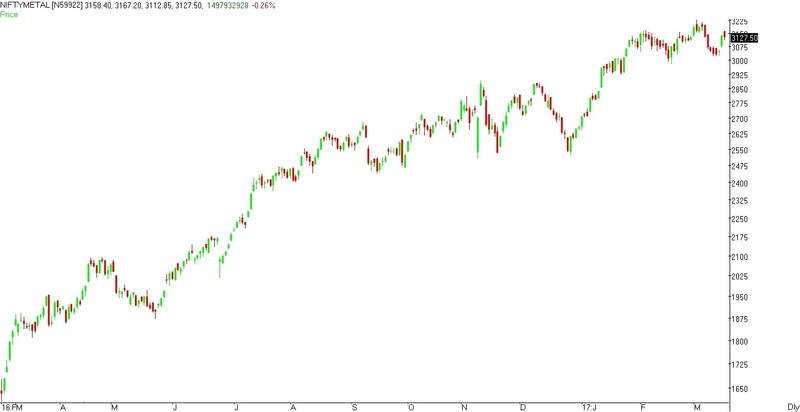 If the index manages close above these levels then the index can move to the levels of 4200 to 4250 where the index has formed a high in the month of January-2018. Broad range for the index is seen between 3800 to 3850 on downside & 4100 to 4150 on upside. Nifty METAL index closed the week on positive note gaining around 0.90%. As we have mentioned last week, that support for the index lies in the zone of 3850 to 3900 where break out levels and medium term moving averages are lying. If the index manages to close below these levels then the index can drift to the levels of 3550 to 3600 where break out levels and long term moving averages are lying. During the week the index manages to hit a low of 3861 and close the week around the levels of 4029. Minor resistance for the index lies in the zone of 3980 to 4000. Support for the index lies in the zone of 3850 to 3900 where break out levels and medium term moving averages are lying. If the index manages to close below these levels then the index can drift to the levels of 3550 to 3600 where break out levels and long term moving averages are lying. Broad range for the index is seen between 3850 to 3900 on downside & 4200 to 4250 on upside. Nifty METAL index closed the week on positive note gaining around 0.20%. As we have mentioned last week, that resistance for the index lies in the zone of 3980 to 4000 where break down levels are lying. If the index manages close above these levels then the index can move to the levels of 4150 to 4200 from where the index has broken down. During the week the index manages to hit a high of 4113 and close the week around the levels of 3992. Resistance for the index lies in the zone of 4000 to 4050 where break down levels are lying. If the index manages close above these levels then the index can move to the levels of 4150 to 4200 from where the index has broken down. Broad range for the index is seen between 3750 to 3800 on downside & 4100 to 4150 on upside. 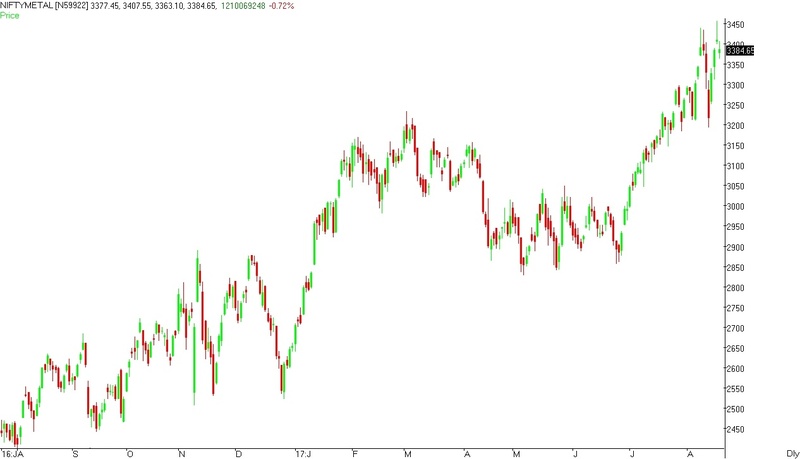 Nifty METAL index closed the week on positive note gaining around 1.00%. As we have mentioned last week, that support for the index lies in the zone of 3850 to 3900 where break out levels and short term moving averages are lying. If the index manages to close below these levels then the index can drift to the levels of 3550 to 3600 where break out levels are lying. During the week the index manages to hit a low of 3718 and close the week around the levels of 3986. Support for the index lies in the zone of 3850 to 3900 where break out levels and short & medium term moving averages are lying. If the index manages to close below these levels then the index can drift to the levels of 3550 to 3600 where break out levels and long term moving averages are lying. Resistance for the index lies in the zone of 3980 to 4000 where break down levels are lying. If the index manages close above these levels then the index can move to the levels of 4150 to 4200 from where the index has broken down. Nifty METAL index closed the week on negative note losing around 4.50%. As we have mentioned last week, that resistance for the index lies in the zone of 4150 to 4200 from where the index has broken down. If the index manages close above these levels then the index can move to the levels of 4250 to 4300 where the index has formed a top. During the week the index manages to hit a high of 4217 and close the week around the levels of 3948. Support for the index lies in the zone of 3850 to 3900 where break out levels and short term moving averages are lying. If the index manages to close below these levels then the index can drift to the levels of 3550 to 3600 where break out levels are lying. Broad range for the index is seen between 3750 to 3800 on downside & 4050 to 4100 on upside. As we have mentioned last week, that support for the index lies in the zone of 3950 to 3980 from where the index has broken out of top formed in the month of October-2017 and November-2017. If the index manages to close below these levels then the index can drift to the levels of 3800 to 3850 where break out levels and short term moving averages are lying. During the week the index manages to hit a low of 3985 and close the week around the levels of 4135. Minor support for the index lies in the zone of 4050 to 4080. Support for the index lies in the zone of 3950 to 3980 from where the index has broken out of top formed in the month of October-2017 and November-2017. If the index manages to close below these levels then the index can drift to the levels of 3800 to 3850 where break out levels and short term moving averages are lying. Resistance for the index lies in the zone of 4150 to 4200 from where the index has broken down. If the index manages close above these levels then the index can move to the levels of 4250 to 4300 where the index has formed a top. Broad range for the index is seen between 3950 to 4000 on downside & 4250 to 4300 on upside. Nifty METAL index closed the week on negative note losing around 3.80%. As we have mentioned last week, that support for the index lies in the zone of 4100 to 4120 where break out levels are lying. 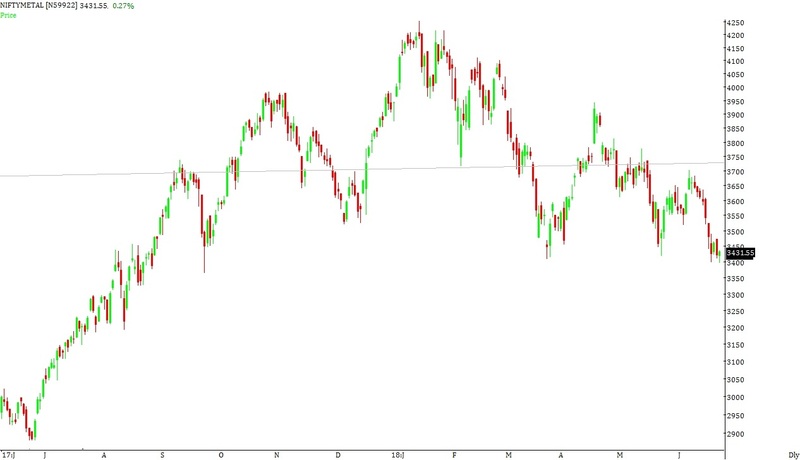 If the index manages to close below these levels then the index can drift to the levels of 3980 to 4020 from where the index has broken out of top formed in the month of October-2017 and November-2017. During the week the index manages to hit a low of 3958 and close the week around the levels of 4033. Support for the index lies in the zone of 3950 to 3980 from where the index has broken out of top formed in the month of October-2017 and November-2017. If the index manages to close below these levels then the index can drift to the levels of 3800 to 3850 where break out levels and short term moving averages are lying. Resistance for the index lies in the zone of 4100 to 4120 from where the index broke down after consolidation. If the index manages close above these levels then the index can move to the levels of 4250 to 4300 where the index has formed a top. 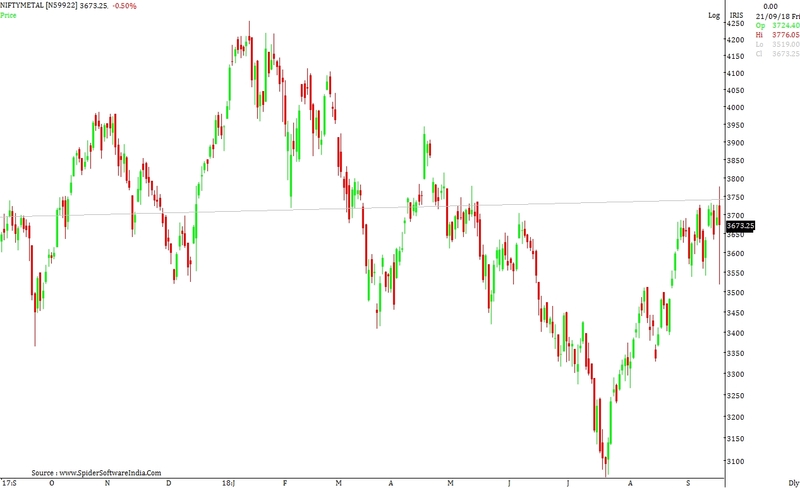 Broad range for the index is seen between 3850 to 3900 on downside & 4150 to 4200 on upside. As we have mentioned last week, that resistance for the index lies in the zone of 4100 to 4150 where trend-line resistance for the index is lying. If the index manages to close above these levels then the index can move to the levels of 4250 to 4300. During the week the index manages to hit a high of 4210 and close the week around the levels of 4189. Support for the index lies in the zone of 4100 to 4120 where break out levels are lying. 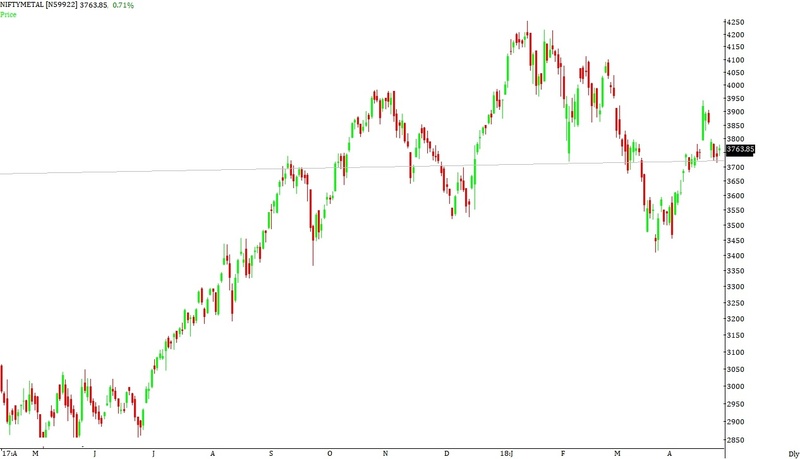 If the index manages to close below these levels then the index can drift to the levels of 3980 to 4020 from where the index has broken out of top formed in the month of October-2017 and November-2017. 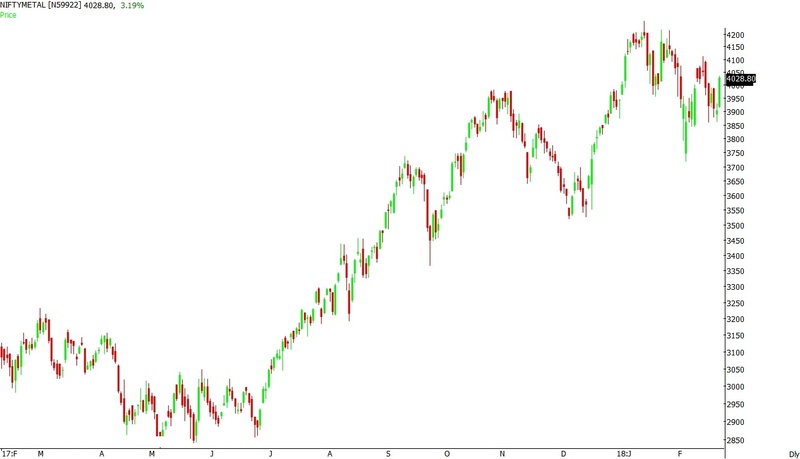 The index is trading at all time highs and is in strong uptrend so virtually no resistance levels are visible. Resistance for the index lies in the zone of 4280 to 4320. Broad range for the index is seen between 3980 to 4020 on downside & 4280 to 4320 on upside. Nifty METAL index closed the week on positive note gaining around 4.80%. As we have mentioned last week, that resistance for the index lies in the zone of 3980 to 4020 where the index has formed a top in the month of October-2017 and November-2017. If the index manages to close above these levels then the index can move to the levels of 4100 to 4150 where trend-line resistance for the index is lying. During the week the index manages to hit a high of 4182 and close the week around the levels of 4130. Support for the index lies in the zone of 3980 to 4020 from where the index has broken out of top formed in the month of October-2017 and November-2017. If the index manages to close below these levels then the index can drift to the levels of 3800 to 3850 where break out levels and short term moving averages are lying. Resistance for the index lies in the zone of 4100 to 4150 where trend-line resistance for the index is lying. If the index manages to close above these levels then the index can move to the levels of 4250 to 4300. Nifty METAL index closed the week on positive note gaining around 2.70%. As we have mentioned last week, that resistance for the index lies in the zone of 3850 to 3900 from where the index broke down after consolidation. 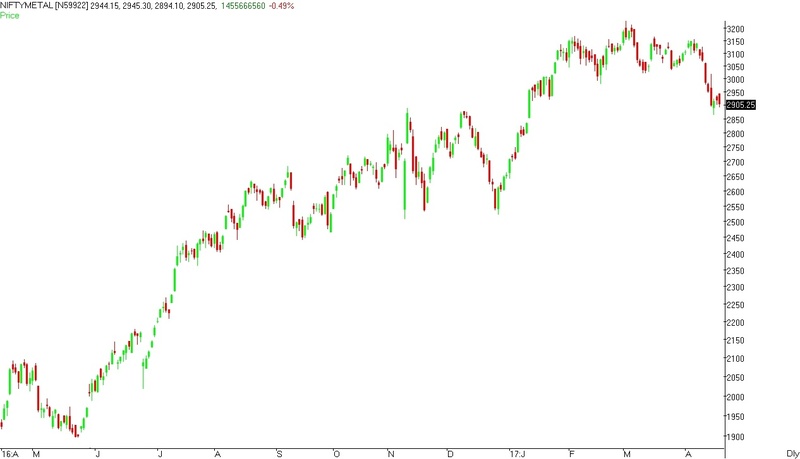 If the index manages to close above these levels then the index can move to the levels of 3980 to 4020 where the index has formed a top in the month of November-2017. During the week the index manages to hit a high of 3985 and close the week around the levels of 3940. Support for the index lies in the zone of 3800 to 3850 where break out levels and short term moving averages are lying. If the index manages to close below these levels then the index can drift to the levels of 3700 to 3750 where medium term moving averages and break out levels are lying. Resistance for the index lies in the zone of 3980 to 4020 where the index has formed a top in the month of October-2017 and November-2017. If the index manages to close above these levels then the index can move to the levels of 4100 to 4150 where trend-line resistance for the index is lying. Broad range for the index is seen between 3700 to 3750 on downside & 4100 to 4150 on upside. Nifty METAL index closed the week on positive note gaining around 4.70%. As we have mentioned last week, that support for the index lies in the zone of 3550 to 3600 where Fibonacci levels are lying. If the index manages to close below these levels then the index can drift to the levels of 3350 to 3400 where the index has formed a bottom in the month of September-2017. During the week the index manages to hit a low of 3553 and close the week around the levels of 3839. Support for the index lies in the zone of 3750 to 3780 where short term moving averages are lying. If the index manages to close below these levels then the index can drift to the levels of 3550 to 3600 where Fibonacci levels are lying. Resistance for the index lies in the zone of 3850 to 3900 from where the index broke down after consolidation. 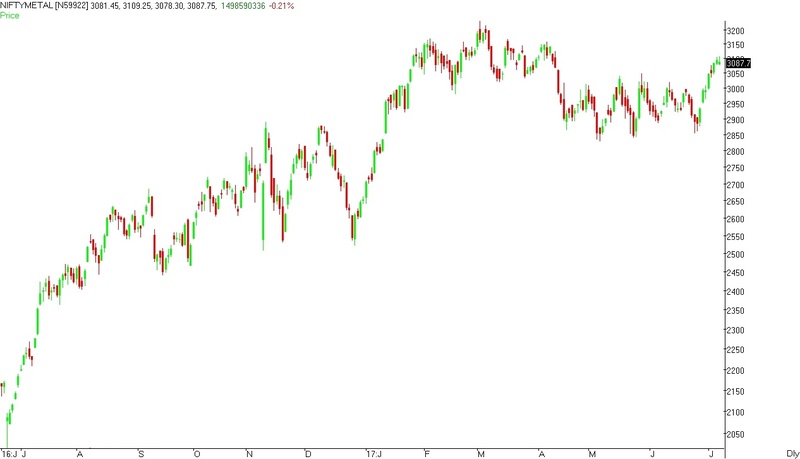 If the index manages to close above these levels then the index can move to the levels of 3980 to 4020 where the index has formed a top in the month of November-2017. Nifty METAL index closed the week on positive note gaining around 0.60%. As we have mentioned last week, that resistance for the index lies in the zone of 3700 to 3750 where trend-line joining earlier highs and short term moving averages are lying. If the index manages to close above these levels then the index can move to the levels of 3900 to 3950 from where the index broke down after consolidation. During the week the index manages to hit a high of 3699 and close the week around the levels of 3666. Support for the index lies in the zone of 3550 to 3600 where Fibonacci levels are lying. If the index manages to close below these levels then the index can drift to the levels of 3350 to 3400 where the index has formed a bottom in the month of September-2017. Resistance for the index lies in the zone of 3700 to 3750 where trend-line joining earlier highs and short term moving averages are lying. If the index manages to close above these levels then the index can move to the levels of 3900 to 3950 from where the index broke down after consolidation. Nifty METAL index closed the week on positive note gaining around 0.70%. As we have mentioned last week, that support for the index lies in the zone of 3550 to 3600 where Fibonacci levels are lying. If the index manages to close below these levels then the index can drift to the levels of 3350 to 3400 where the index has formed a bottom in the month of September-2017. During the week the index manages to hit a low of 3521 and close the week around the levels of 3643. Nifty METAL index closed the week on negative note losing around 3.90%. As we have mentioned last week, that support for the index lies in the zone of 3700 to 3750 where trend-line joining earlier highs and short term moving averages are lying. If the index manages to close below these levels then the index can drift to the levels of 3550 to 3600 where Fibonacci levels are lying. During the week the index manages to hit a low of 3610 and close the week around the levels of 3618. Broad range for the index is seen between 3350 to 3400 on downside & 3800 to 3850 on upside. As we have mentioned last week, that minor resistance for the index lies in the zone of 3800 to 3830. Resistance for the index lies in the zone of 3900 to 3950 from where the index broke down after consolidation. 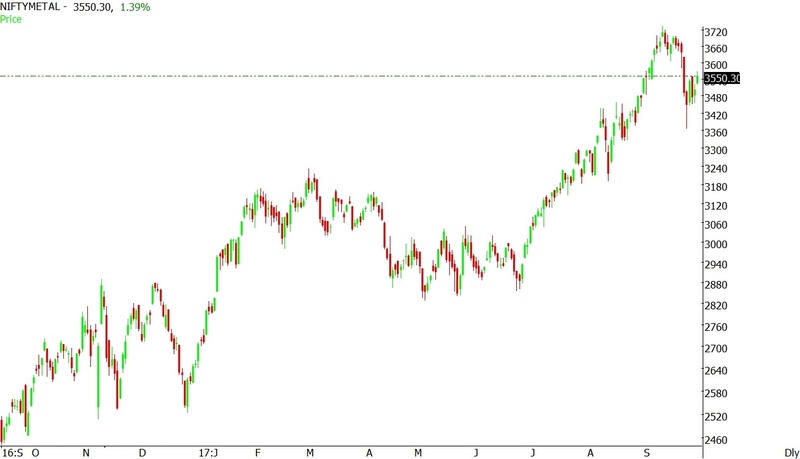 If the index manages to close above these levels then the index can move to the levels of 4050 to 4100. During the week the index manages to hit a high of 3855 and close the week around the levels of 3766. Support for the index lies in the zone of 3700 to 3750 where trend-line joining earlier highs and short term moving averages are lying. If the index manages to close below these levels then the index can drift to the levels of 3550 to 3600 where Fibonacci levels are lying. Minor resistance for the index lies in the zone of 3800 to 3830. Resistance for the index lies in the zone of 3900 to 3950 from where the index broke down after consolidation. 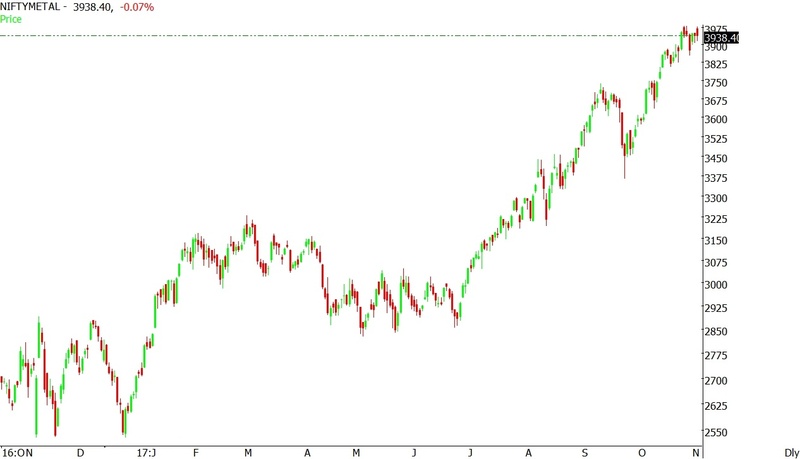 If the index manages to close above these levels then the index can move to the levels of 4050 to 4100. Broad range for the index is seen between 3600 to 3650 on downside & 4000 to 4050 on upside. Nifty METAL index closed the week on negative note losing around 2.50%. As we have mentioned last week, that minor support for the index lies in the zone of 3800 to 3830. Support for the index lies in the zone of 3680 to 3720 where trend-line joining earlier highs and short term moving averages are lying. If the index manages to close below these levels then the index can drift to the levels of 3550 to 3600 where Fibonacci levels are lying. During the week the index manages to hit a low of 3641 and close the week around the levels of 3768. Support for the index lies in the zone of 3680 to 3720 where trend-line joining earlier highs and short term moving averages are lying. If the index manages to close below these levels then the index can drift to the levels of 3550 to 3600 where Fibonacci levels are lying. Nifty METAL index closed the week on negative note losing around 1.80%. As we have mentioned last week, that minor support for the index lies in the zone of 3840 to 3870. Support for the index lies in the zone of 3680 to 3720 where trend-line joining earlier highs is lying. If the index manages to close below these levels then the index can drift to the levels of 3550 to 3600 where Fibonacci levels are lying. During the week the index manages to hit a low of 3802 and close the week around the levels of 3866. Minor support for the index lies in the zone of 3800 to 3830. Support for the index lies in the zone of 3680 to 3720 where trend-line joining earlier highs and short term moving averages are lying. If the index manages to close below these levels then the index can drift to the levels of 3550 to 3600 where Fibonacci levels are lying. Resistance for the index lies in the zone of 3900 to 3950 from where the index broke down after consolidation. 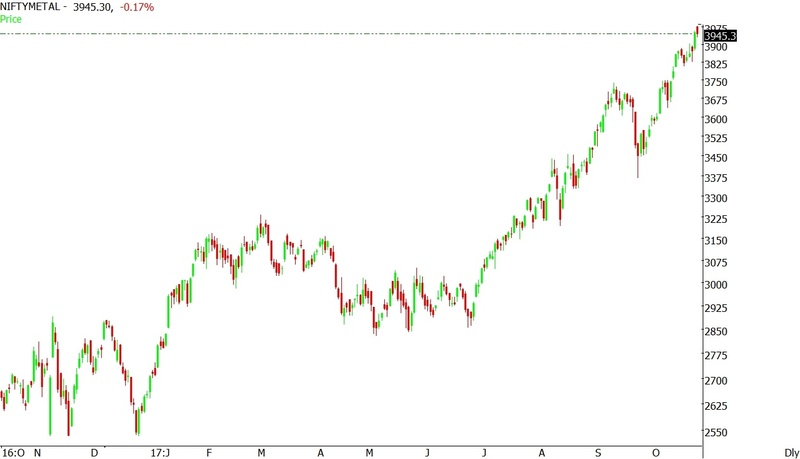 If the index manages to close above these levels then the index can move to the levels of 4050 to 4100. As we have mentioned last week, that minor support for the index lies in the zone of 3800 to 3850. Support for the index lies in the zone of 3680 to 3720 where trend-line joining earlier highs is lying. If the index manages to close below these levels then the index can drift to the levels of 3550 to 3600 where Fibonacci levels are lying. During the week the index manages to hit a low of 3854 and close the week around the levels of 3938. Minor support for the index lies in the zone of 3840 to 3870. Support for the index lies in the zone of 3680 to 3720 where trend-line joining earlier highs is lying. If the index manages to close below these levels then the index can drift to the levels of 3550 to 3600 where Fibonacci levels are lying. Resistance for the index lies in the zone of 3950 to 4000. If the index manages to close above these levels then the index can move to the levels of 4100 to 4150. As we have mentioned last week, that resistance for the index lies in the zone of 3850 to 3870. If the index manages to close above these levels then the index can move to the levels of 3920 to 3950. During the week the index manages to hit a high of 3982 and close the week around the levels of 3945. Minor support for the index lies in the zone of 3800 to 3850. Support for the index lies in the zone of 3680 to 3720 where trend-line joining earlier highs is lying. If the index manages to close below these levels then the index can drift to the levels of 3550 to 3600 where Fibonacci levels are lying. Resistance for the index lies in the zone of 3920 to 3950. If the index manages to close above these levels then the index can move to the levels of 4100 to 4150. As we have mentioned last week, that resistance for the index lies in the zone of 3770 to 3800. If the index manages to close above these levels then the index can move to the levels of 3850 to 3870. During the week the index manages to hit a high of 3885 and close the week around the levels of 3820. Minor support for the index lies in the zone of 3750 to 3770. Support for the index lies in the zone of 3680 to 3720 where trend-line joining earlier highs is lying. If the index manages to close below these levels then the index can drift to the levels of 3550 to 3600 where Fibonacci levels are lying. Resistance for the index lies in the zone of 3850 to 3870. If the index manages to close above these levels then the index can move to the levels of 3920 to 3950. Broad range for the index is seen between 3650 to 3670 on downside & 3950 to 3970 on upside. Nifty METAL index closed the week on positive note gaining around 2.00%. As we have mentioned last week, that resistance for the index lies in the zone of 3680 to 3720 where trend-line joining earlier highs is lying. 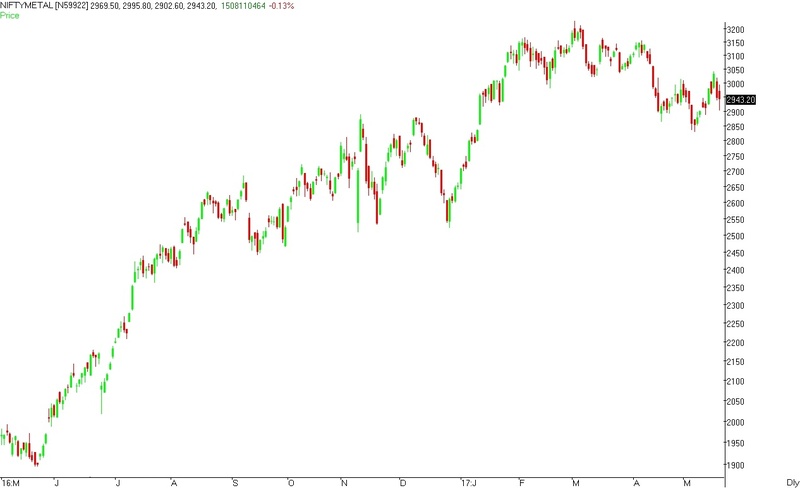 If the index manages to close above these levels then the index can move to the levels of 3770 to 3800. During the week the index manages to hit a high of 3808 and close the week around the levels of 3784. Support for the index lies in the zone of 3680 to 3720 where trend-line joining earlier highs is lying. If the index manages to close below these levels then the index can drift to the levels of 3550 to 3600 where Fibonacci levels are lying. Resistance for the index lies in the zone of 3770 to 3800. If the index manages to close above these levels then the index can move to the levels of 3850 to 3870. Broad range for the index is seen between 3650 to 3670 on downside & 3850 to 3870 on upside. As we have mentioned last week, that resistance for the index lies in the zone of 3550 to 3600 where Fibonacci levels are lying. If the index manages to close above these levels then the index can move to the levels of 3650 to 3700 where trend-line joining earlier highs is lying. During the week the index manages to hit a high of 3720 and close the week around the levels of 3711. Support for the index lies in the zone of 3550 to 3600 where Fibonacci levels are lying. 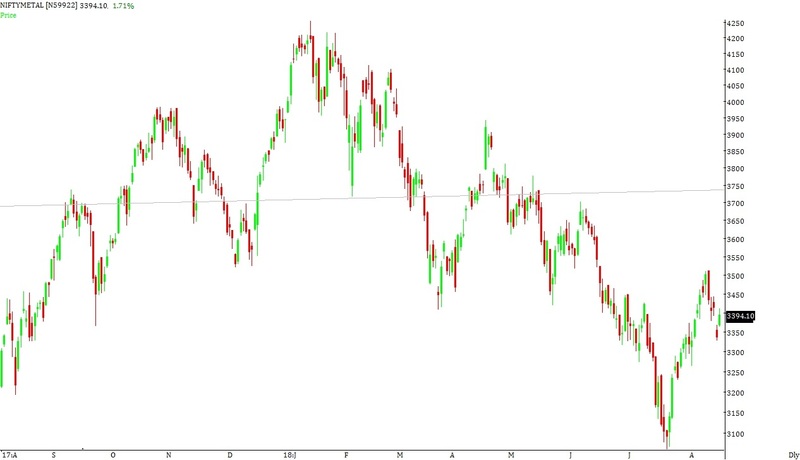 If the index manages to close below these levels then the index can drift to the levels of 3420 to 3450 from where the index broke out of double top pattern and short term moving averages are lying. Resistance for the index lies in the zone of 3680 to 3720 where trend-line joining earlier highs is lying. 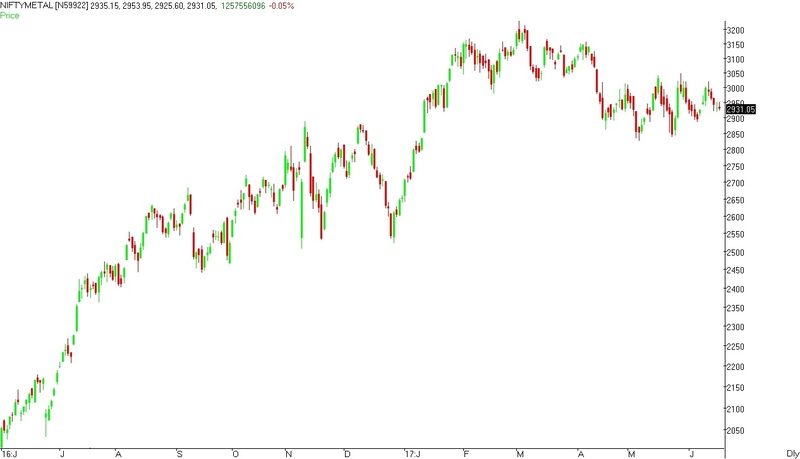 If the index manages to close above these levels then the index can move to the levels of 3770 to 3800. Nifty METAL index closed the week on positive note gaining around 1.70%. As we have mentioned last week, that resistance for the index lies in the zone of 3550 to 3600 where Fibonacci levels are lying. If the index manages to close above these levels then the index can move to the levels of 3650 to 3700 where trend-line joining earlier highs is lying. During the week the index manages to hit a high of 3570 and close the week around the levels of 3550. Support for the index lies in the zone of 3420 to 3450 from where the index broke out of double top pattern and short term moving averages are lying. If the index manages to close below these levels then the index can drift to the levels of 3200 to 3230 from where the index broke out of March-2017 highs. Resistance for the index lies in the zone of 3550 to 3600 where Fibonacci levels are lying. If the index manages to close above these levels then the index can move to the levels of 3650 to 3700 where trend-line joining earlier highs is lying. Nifty METAL index closed the week on negative note losing around 4.70%. As we have mentioned last week, that support for the index lies in the zone of 3550 to 3600 where Fibonacci levels are lying. 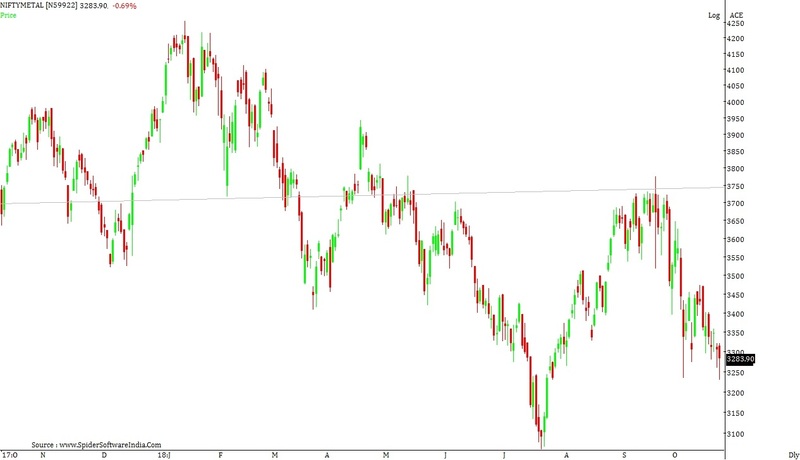 If the index manages to close below these levels then the index can drift to the levels of 3450 to 3500 from where the index broke out of double top pattern. During the week the index manages to hit a low of 3479 and close the week around the levels of 3492. Support for the index lies in the zone of 3410 to 3440 from where the index broke out of double top pattern and short term moving averages are lying. 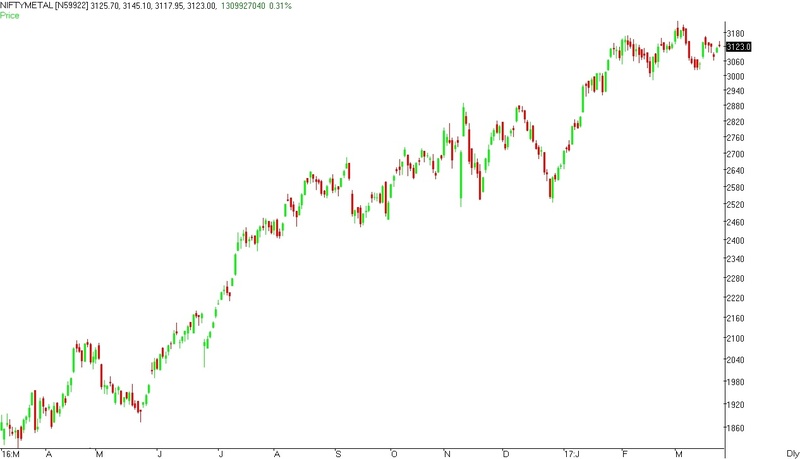 If the index manages to close below these levels then the index can drift to the levels of 3200 to 3230 from where the index broke out of March-2017 highs. Broad range for the index is seen between 3200 to 3250 on downside & 3700 to 3750 on upside. As we have mentioned last week, that resistance for the index lies in the zone of 3650 to 3700 where trend-line joining earlier highs is lying. If the index manages to close above these levels then the index can move to the levels of 3750 to 3770. During the week the index manages to hit a high of 3739 and close the week around the levels of 3663. Support for the index lies in the zone of 3550 to 3600 where Fibonacci levels are lying. 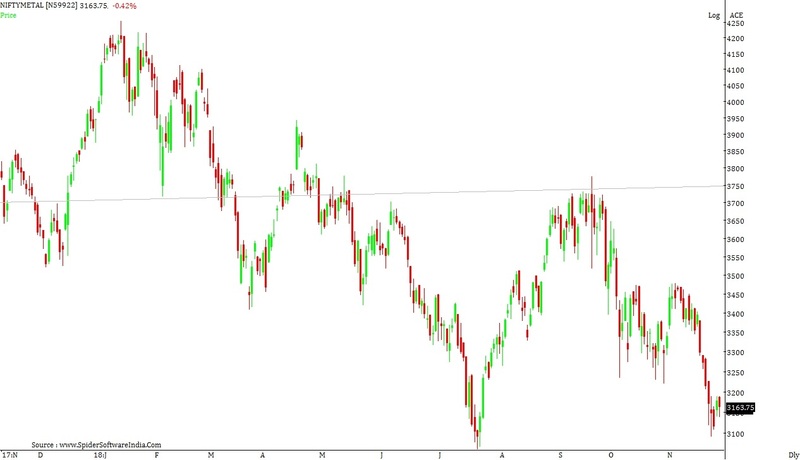 If the index manages to close below these levels then the index can drift to the levels of 3450 to 3500 from where the index broke out of double top pattern. Resistance for the index lies in the zone of 3650 to 3700 where trend-line joining earlier highs is lying. If the index manages to close above these levels then the index can move to the levels of 3750 to 3770. 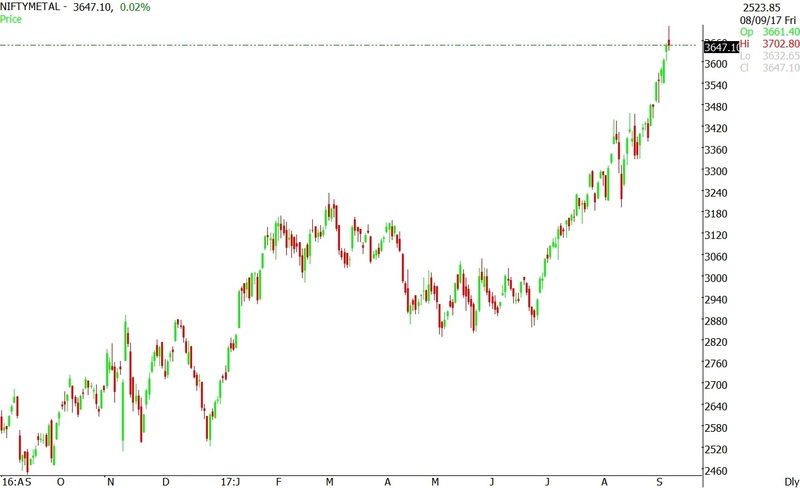 Nifty METAL index closed the week on positive note gaining around 3.00%. As we have mentioned last week, that support for the index lies in the zone of 3450 to 3460 from where the index has broken out of double top pattern. If the index manages to close below these levels then the index can drift to the levels of 3320 to 3350 where the index has taken multiple support. During the week the index manages to hit a low of 3486 and close the week around the levels of 3653. Nifty METAL index closed the week on positive note gaining around 3.80%. 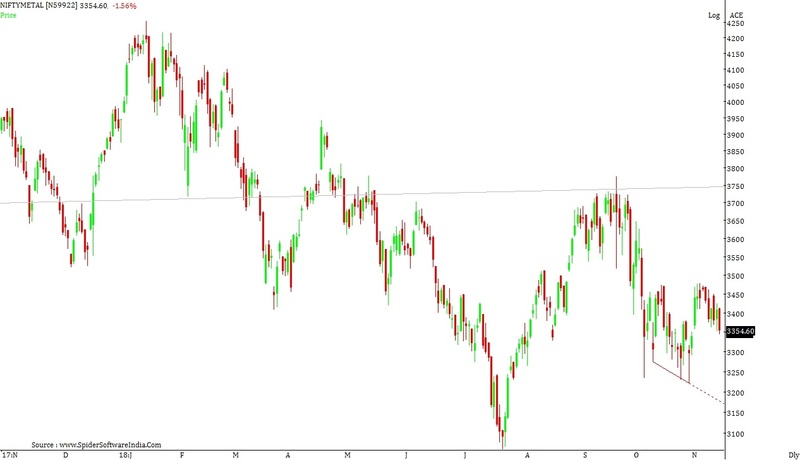 As we have mentioned last week, that resistance for the index lies in the zone of 3450 to 3460 where the index has formed a double top pattern. 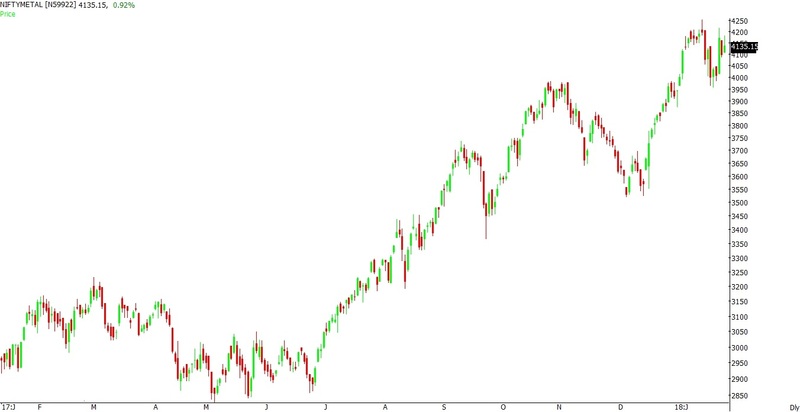 If the index manages to close above these levels then the index can move to the levels of 3520 to 3550 where the index has formed a life time high. During the week the index manages to hit a high of 3545 and close the week around the levels of 3542. 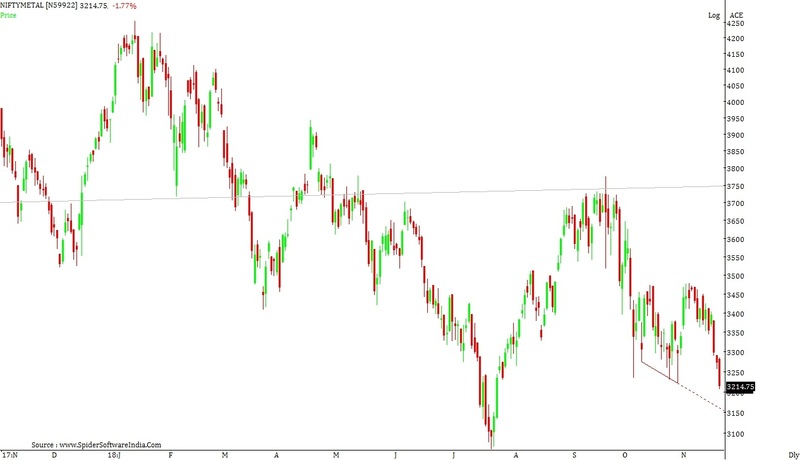 Support for the index lies in the zone of 3450 to 3460 from where the index has broken out of double top pattern. If the index manages to close below these levels then the index can drift to the levels of 3320 to 3350 where the index has taken multiple support. Resistance for the index lies in the zone of 3520 to 3550 where the index has formed a life time high. 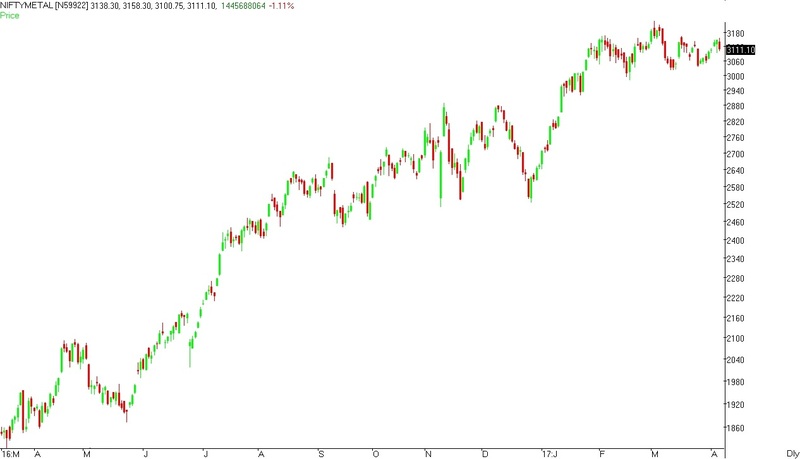 If the index manages to close above these levels then the index can move to the levels of 3600 to 3650. Broad range for the index is seen between 3320 to 3380 on downside & 3650 to 3700 on upside. As we have mentioned last week, that minor support for the index lies in the zone of 3300 to 3330. Support for the index lies in the zone of 3200 to 3230 from where the index broke out of March-2017 highs. If the index manages to close below these levels then the index can drift to the levels of 3060 to 3100 where break out levels for the index is lying and short term moving averages are lying. During the week the index manages to hit a low of 3328 and close the week around the levels of 3414. Minor support for the index lies in the zone of 3340 to 3370. Support for the index lies in the zone of 3200 to 3230 from where the index broke out of March-2017 highs. If the index manages to close below these levels then the index can drift to the levels of 3060 to 3100 where break out levels for the index is lying and short term moving averages are lying. 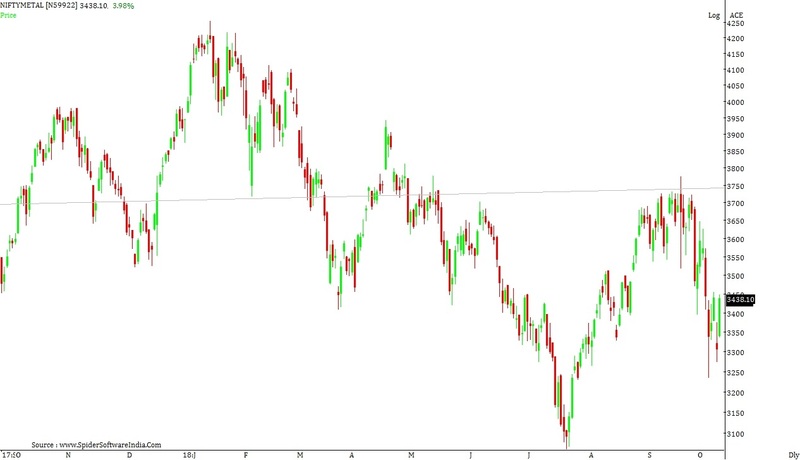 Resistance for the index lies in the zone of 3450 to 3460 where the index has formed a double top pattern. 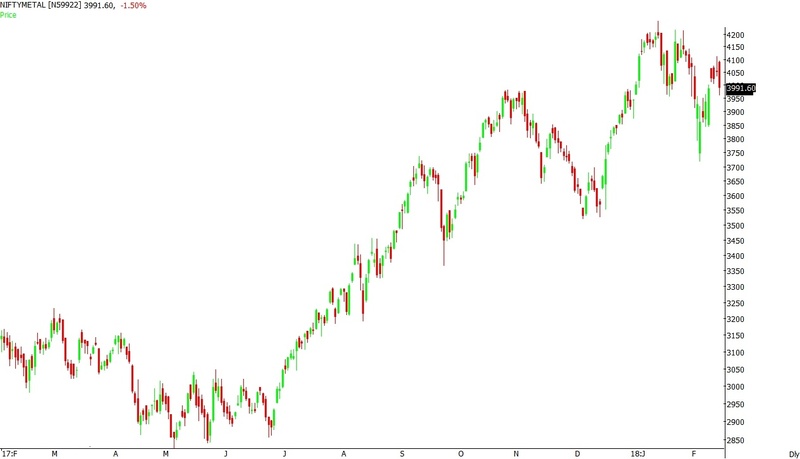 If the index manages to close above these levels then the index can move to the levels of 3520 to 3550 where the index has formed a life time high. Broad range for the index is seen between 3280 to 3320 on downside & 3530 to 3550 on upside. Nifty METAL index closed the week on positive note gaining around 5.20%. As we have mentioned last week, that support for the index lies in the zone of 3200 to 3230 from where the index broke out of March-2017 highs. If the index manages to close below these levels then the index can drift to the levels of 3060 to 3100 where break out levels for the index is lying and short term moving averages are lying. During the week the index manages to hit a low of 3251 and close the week around the levels of 3385. Minor support for the index lies in the zone of 3300 to 3330. Support for the index lies in the zone of 3200 to 3230 from where the index broke out of March-2017 highs. If the index manages to close below these levels then the index can drift to the levels of 3060 to 3100 where break out levels for the index is lying and short term moving averages are lying. Broad range for the index is seen between 3250 to 3280 on downside & 3500 to 3550 on upside. Nifty METAL index closed the week on negative note losing around 2.60%. As we have mentioned last week, that minor support for the index lies in the zone of 3250 to 3270. Support for the index lies in the zone of 3200 to 3230 from where the index broke out of March-2017 highs. If the index manages to close below these levels then the index can drift to the levels of 3050 to 3100 where break out levels for the index is lying and short term moving averages are lying. During the week the index manages to hit a low of 3194 and close the week around the levels of 3217. Support for the index lies in the zone of 3200 to 3230 from where the index broke out of March-2017 highs. If the index manages to close below these levels then the index can drift to the levels of 3060 to 3100 where break out levels for the index is lying and short term moving averages are lying. Resistance for the index lies in the zone of 3300 to 3330. 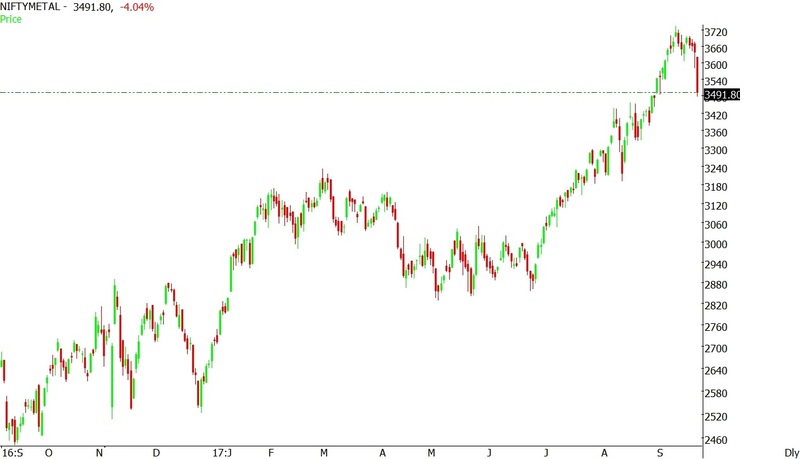 If the index manages to close above these levels then the index can move to the levels of 3400 to 3450 where the index has formed a short term top. As we have mentioned last week, that resistance for the index lies in the zone of 3200 to 3230 where the index has formed a top in the month of March-2017. If the index manages to close above these levels then the index can move to the levels of 3300 to 3325. During the week the index manages to hit a high of 3310 and close the week around the levels of 3302. Minor support for the index lies in the zone of 3250 to 3270. Support for the index lies in the zone of 3200 to 3230 from where the index broke out of March-2017 highs. If the index manages to close below these levels then the index can drift to the levels of 3050 to 3100 where break out levels for the index is lying and short term moving averages are lying. Resistance for the index lies in the zone of 3330 to 3350. 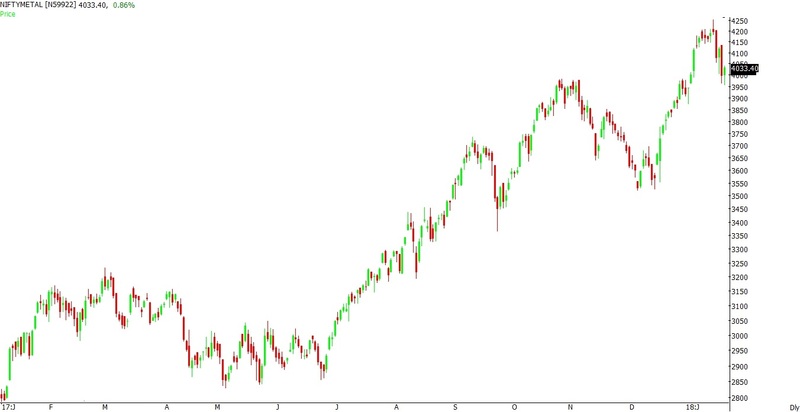 If the index manages to close above these levels then the index can move to the levels of 3500 to 3550 where life time highs for the index is lying. As we have mentioned last week, that resistance for the index lies in the zone of 3200 to 3230 where the index has formed a top in the month of March-2017. If the index manages to close above these levels then the index can move to the levels of 3300 to 3325. During the week the index manages to hit a high of 3298 and close the week around the levels of 3207. Minor support for the index lies in the zone of 3150 to 3170. Support for the index lies in the zone of 3050 to 3070 from where the index broke out of May-2017 highs. If the index manages to close below these levels then the index can drift to the levels of 2920 to 2950 from where the index has opened gap up. Resistance for the index lies in the zone of 3200 to 3230 where the index has formed a top in the month of March-2017. If the index manages to close above these levels then the index can move to the levels of 3300 to 3325. As we have mentioned last week, that resistance for the index lies in the zone of 3100 to 3150 from where the index has broken down in the month of March-2017 and April-2017. If the index manages to close above these levels then the index can move to the levels of 3200 to 3230 where the index has formed a top in the month of March-2017. During the week the index manages to hit a high of 3232 and close the week around the levels of 3203. As we have mentioned last week, that resistance for the index lies in the zone of 3100 to 3150 from where the index has broken down in the month of March-2017 and April-2017. 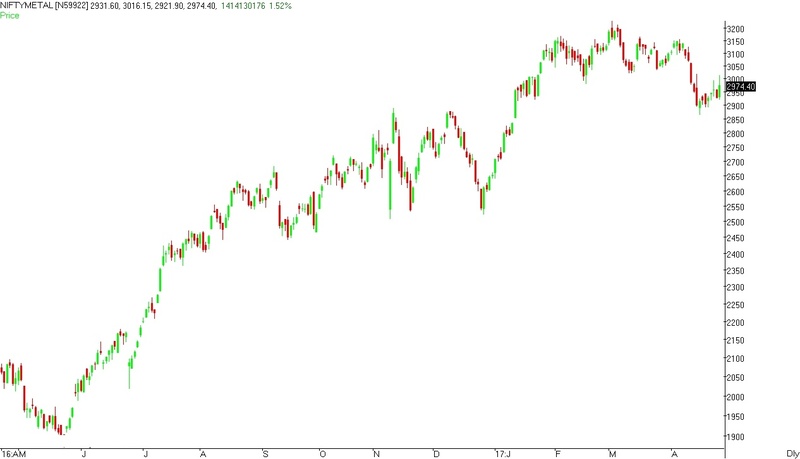 If the index manages to close above these levels then the index can move to the levels of 3200 to 3230 where the index has formed a top in the month of March-2017. During the week the index manages to hit a high of 3164 and close the week around the levels of 3140. Minor support for the index lies in the zone of 3080 to 3100. Support for the index lies in the zone of 3030 to 3050 from where the index broke out of May-2017 highs. If the index manages to close below these levels then the index can drift to the levels of 2920 to 2950 from where the index has opened gap up. Resistance for the index lies in the zone of 3100 to 3150 from where the index has broken down in the month of March-2017 and April-2017. If the index manages to close above these levels then the index can move to the levels of 3200 to 3230 where the index has formed a top in the month of March-2017. 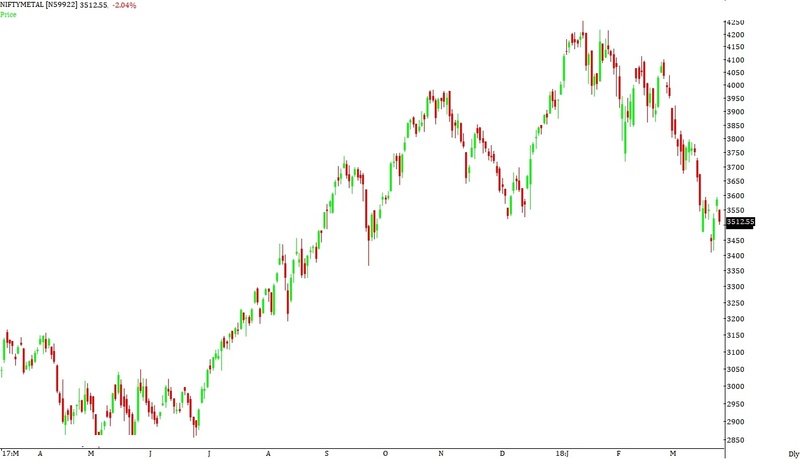 Broad range for the index is seen between 3000 to 3030 on downside & 3230 to 3250 on upside. Nifty METAL index closed the week on positive note gaining around 3.20%. As we have mentioned last week, that resistance for the index lies in the zone of 3020 to 3050 where medium term moving averages and the highs for the month of May-2017 are lying. If the index manages to close above these levels then the index can move to the levels of 3070 to 3100 from where the index has broken down in the month of April-2017. During the week the index manages to hit a high of 3109 and close the week around the levels of 3088. Minor support for the index lies in the zone of 3020 to 3050. Support for the index lies in the zone of 2920 to 2950 from where the index has opened gap up. If the index manages to close below these levels then the index can drift to the levels of 2830 to 2850 where the index has taken multiple support and 200 Daily moving averages. Broad range for the index is seen between 2800 to 2850 on downside & 3170 to 3200 on upside. Nifty METAL index closed the week on positive note gaining around 3.40%. As we have mentioned last week that minor resistance for the index lies in the zone of 2920 to 2950. Resistance for the index lies in the zone of 3020 to 3050 where medium term moving averages and the highs for the month of May-2017 are lying. If the index manages to close above these levels then the index can move to the levels of 3070 to 3100 from where the index has broken down in the month of April-2017. During the week the index manages to hit a high of 3011 and close the week around the levels of 2991. Minor support for the index lies in the zone of 2930 to 2950. Support for the index lies in the zone of 2830 to 2850 where the index has taken multiple support and 200 Daily moving averages are lying. If the index manages to close below these levels then the index can drift to the levels of 2750 to 2780 where Fibonacci levels are lying. Resistance for the index lies in the zone of 3020 to 3050 where medium term moving averages and the highs for the month of May-2017 are lying. If the index manages to close above these levels then the index can move to the levels of 3070 to 3100 from where the index has broken down in the month of April-2017. Broad range for the index is seen between 2850 to 2900 on downside & 3070 to 3100 on upside. Nifty METAL index closed the week on negative note losing around 1.30%. As we have mentioned last week that minor support for the index lies in the zone of 2880 to 2900. Support for the index lies in the zone of 2830 to 2850 where short term bottom and 200 Daily moving averages are lying. If the index manages to close below these levels then the index can drift to the levels of 2750 to 2780 where Fibonacci levels are lying. During the week the index manages to hit a low of 2857 and close the week around the levels of 2892. Minor support for the index lies in the zone of 2880 to 2900. Support for the index lies in the zone of 2830 to 2850 where short term bottom and 200 Daily moving averages are lying. If the index manages to close below these levels then the index can drift to the levels of 2750 to 2780 where Fibonacci levels are lying. Minor resistance for the index lies in the zone of 2920 to 2950. Resistance for the index lies in the zone of 3020 to 3050 where medium term moving averages and the highs for the month of May-2017 are lying. If the index manages to close above these levels then the index can move to the levels of 3070 to 3100 from where the index has broken down in the month of April-2017. Broad range for the index is seen between 2750 to 2780 on downside & 3000 to 3030 on upside. As we have mentioned last week that resistance for the index lies in the zone of 3030 to 3050 where medium term moving averages and the highs for the month of May-2017 are lying. If the index manages to close above these levels then the index can move to the levels of 3070 to 3100 from where the index has broken down in the month of April-2017. During the week the index manages to hit a high of 3022 and close the week around the levels of 2931. Minor resistance for the index lies in the zone of 2950 to 2970. Resistance for the index lies in the zone of 3030 to 3050 where medium term moving averages and the highs for the month of May-2017 are lying. If the index manages to close above these levels then the index can move to the levels of 3070 to 3100 from where the index has broken down in the month of April-2017. Broad range for the index is seen between 2800 to 2830 on downside & 3000 to 3030 on upside. As we have mentioned last week that minor support for the index lies in the zone of 2900 to 2930. Support for the index lies in the zone of 2820 to 2840 where short term bottom and 200 Daily moving averages are lying. If the index manages to close below these levels then the index can drift to the levels of 2750 to 2780 where Fibonacci levels are lying. During the week the index manages to hit a low of 2888 and close the week around the levels of 2998. Minor support for the index lies in the zone of 2920 to 2940. Support for the index lies in the zone of 2830 to 2850 where short term bottom and 200 Daily moving averages are lying. If the index manages to close below these levels then the index can drift to the levels of 2750 to 2780 where Fibonacci levels are lying. Resistance for the index lies in the zone of 3030 to 3050 where medium term moving averages and the highs for the month of May-2017 are lying. If the index manages to close above these levels then the index can move to the levels of 3070 to 3100 from where the index has broken down in the month of April-2017. Broad range for the index is seen between 2900 to 2930 on downside & 3080 to 3100 on upside. As we have mentioned last week that minor support for the index lies in the zone of 2900 to 2930. Support for the index lies in the zone of 2820 to 2840 where short term bottom and 200 Daily moving averages are lying. If the index manages to close below these levels then the index can drift to the levels of 2750 to 2780 where Fibonacci levels are lying. During the week the index manages to hit a low of 2908 and close the week around the levels of 2923. Minor support for the index lies in the zone of 2900 to 2930. Support for the index lies in the zone of 2820 to 2840 where short term bottom and 200 Daily moving averages are lying. If the index manages to close below these levels then the index can drift to the levels of 2750 to 2780 where Fibonacci levels are lying. Resistance for the index lies in the zone of 2990 to 3020 from where the index broke down after consolidation and short & medium term moving averages are lying. If the index manages to close above these levels then the index can move to the levels of 3070 to 3100 from where the index has broken down in the month of April-2017. Broad range for the index is seen between 2800 to 2830 on downside & 3050 to 3080 on upside. As we have mentioned last week that minor support for the index lies in the zone of 2875 to 2900. Support for the index lies in the zone of 2820 to 2840 where short term bottom and 200 Daily moving averages are lying. If the index manages to close below these levels then the index can drift to the levels of 2750 to 2780 where Fibonacci levels are lying. During the week the index manages to hit a low of 2841 and close the week around the levels of 2997. As we have mentioned last week that minor resistance for the index lies in the zone of 2900 to 2920. Resistance for the index lies in the zone of 2980 to 3020 from where the index broke down after consolidation and short & medium term moving averages are lying. If the index manages to close above these levels then the index can move to the levels of 3130 to 3150. During the week the index manages to hit a high of 3042 and close the week around the levels of 2943. Minor support for the index lies in the zone of 2875 to 2900. Support for the index lies in the zone of 2820 to 2840 where short term bottom and 200 Daily moving averages are lying. If the index manages to close below these levels then the index can drift to the levels of 2750 to 2780 where Fibonacci levels are lying. Resistance for the index lies in the zone of 2980 to 3020 from where the index broke down after consolidation and short & medium term moving averages are lying. If the index manages to close above these levels then the index can move to the levels of 3130 to 3150. 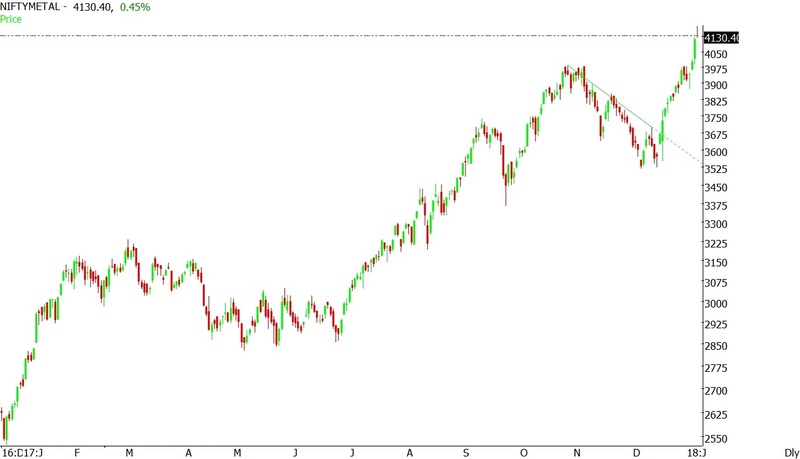 Broad range for the index is seen between 2800 to 2830 on downside & 3030 to 3050 on upside. As we have mentioned last week that minor resistance for the index lies in the zone of 2900 to 2920. Resistance for the index lies in the zone of 3020 to 3050 from where the index broke down after consolidation and short term moving averages are lying. If the index manages to close above these levels then the index can move to the levels of 3130 to 3150. During the week the index manages to hit a high of 2947 and close the week around the levels of 2912. Minor support for the index lies in the zone of 2875 to 2900. Support for the index lies in the zone of 2750 to 2800 where Fibonacci levels and 200 Daily moving averages are lying. If the index manages to close below these levels then the index can drift to the levels of 2680 to 2700. Minor resistance for the index lies in the zone of 2900 to 2920. Resistance for the index lies in the zone of 2980 to 3020 from where the index broke down after consolidation and short & medium term moving averages are lying. If the index manages to close above these levels then the index can move to the levels of 3130 to 3150. 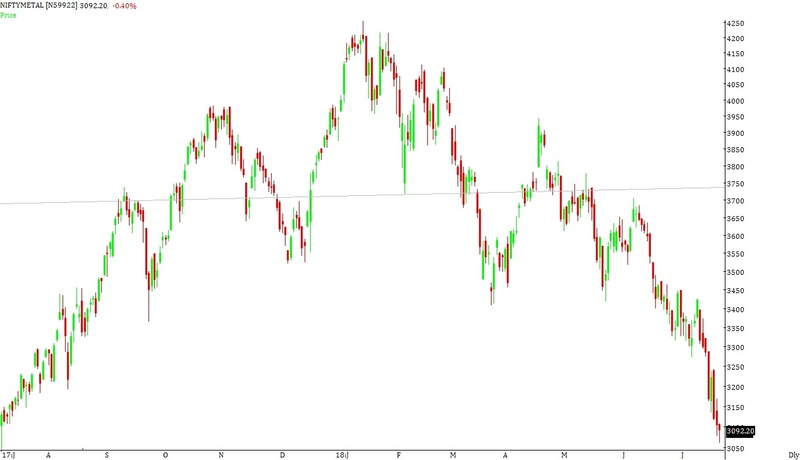 As we have mentioned last week that resistance for the index lies in the zone of 3020 to 3050 from where the index broke down after consolidation and short term moving averages are lying. If the index manages to close above these levels then the index can move to the levels of 3130 to 3150. During the week the index manages to hit a high of 3010 and close the week around the levels of 2857. Support for the index lies in the zone of 2750 to 2800 where Fibonacci levels and 200 Daily moving averages are lying. If the index manages to close below these levels then the index can drift to the levels of 2680 to 2700. Minor resistance for the index lies in the zone of 2900 to 2920. Resistance for the index lies in the zone of 3020 to 3050 from where the index broke down after consolidation and short term moving averages are lying. If the index manages to close above these levels then the index can move to the levels of 3130 to 3150. Broad range for the index is seen between 2680 to 2700 on downside & 3000 to 3030 on upside. Nifty METAL index closed the week on positive note gaining around 2.40%. As we have mentioned last week that minor resistance for the index lies in the zone of 2950 to 2970. Resistance for the index lies in the zone of 3020 to 3050 from where the index broke down after consolidation and short term moving averages are lying. If the index manages to close above these levels then the index can move to the levels of 3130 to 3150. During the week the index manages to hit a high of 3016 and close the week around the levels of 2974. Minor support for the index lies in the zone of 2940 to 2950. Support for the index lies in the zone of 2880 to 2910 from where the index broke out from November-2016 and December-2016 highs. If the index manages to close below these levels then the index can drift to the levels of 2750 to 2800 where Fibonacci levels and 200 Daily moving averages are lying. Resistance for the index lies in the zone of 3020 to 3050 from where the index broke down after consolidation and short term moving averages are lying. If the index manages to close above these levels then the index can move to the levels of 3130 to 3150. Broad range for the index is seen between 2870 to 2900 on downside & 3100 to 3130 on upside. As we have mentioned last week that minor resistance for the index lies in the zone of 3020 to 3040. Resistance for the index lies in the zone of 3080 to 3100 from where the index broke down after consolidation. If the index manages to close above these levels then the index can move to the levels of 3150 to 3170. During the week the index manages to hit a high of 3020 and close the week around the levels of 2905. Support for the index lies in the zone of 2880 to 2910 from where the index broke out from November-2016 and December-2016 highs. If the index manages to close below these levels then the index can drift to the levels of 2750 to 2800 where Fibonacci levels and 200 Daily moving averages are lying. Minor resistance for the index lies in the zone of 2950 to 2970. Resistance for the index lies in the zone of 3020 to 3050 from where the index broke down after consolidation and short term moving averages are lying. If the index manages to close above these levels then the index can move to the levels of 3130 to 3150. 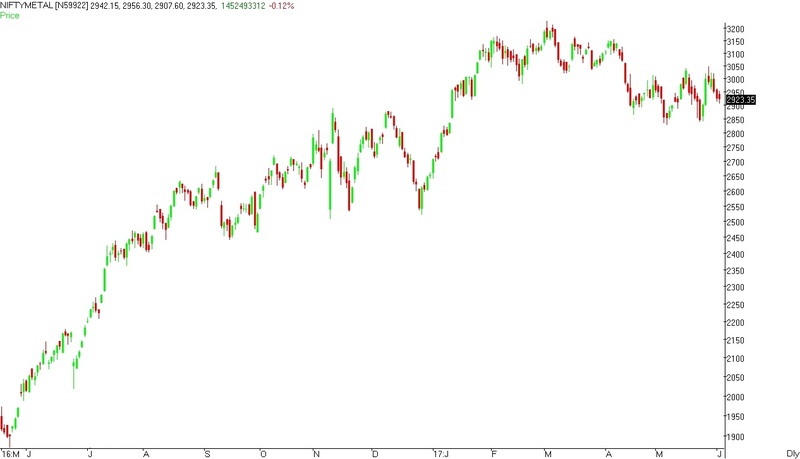 Nifty METAL index closed the week on negative note losing around 4.00%. As we have mentioned last week that minor support for the index lies in the zone of 3060 to 3080. Support for the index lies in the zone of 2990 to 3020 where bottom for the month of February-2017 is lying. 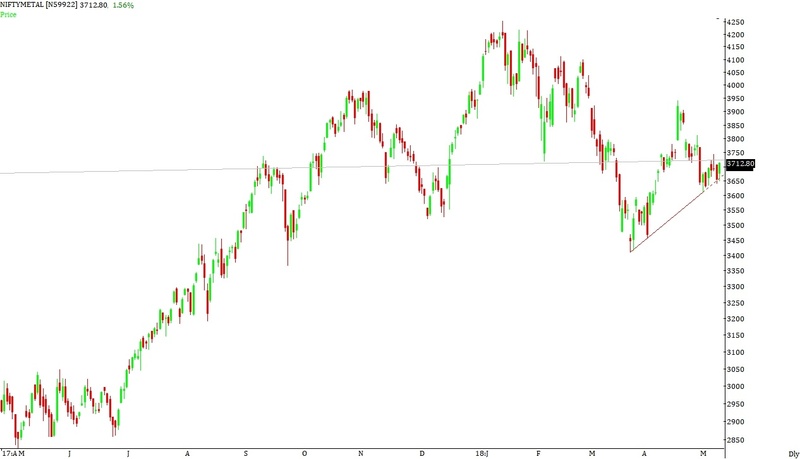 If the index manages to close below these levels then the index can drift to the levels of 2890 to 2910 from where the index broke out from November-2016 and December-2016 highs. During the week the index manages to hit a low of 2980 and close the week around the levels of 2986. Support for the index lies in the zone of 2980 to 3000 where bottom for the month of February-2017 is lying. 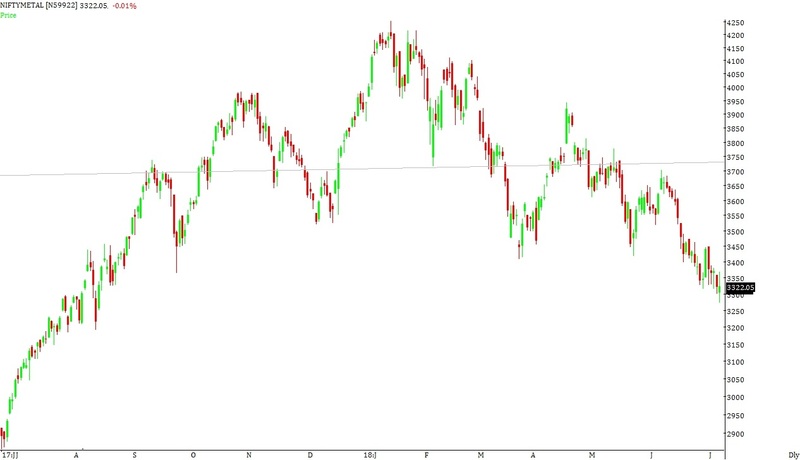 If the index manages to close below these levels then the index can drift to the levels of 2890 to 2910 from where the index broke out from November-2016 and December-2016 highs. Minor resistance for the index lies in the zone of 3020 to 3040. Resistance for the index lies in the zone of 3080 to 3100 from where the index broke down after consolidation. If the index manages to close above these levels then the index can move to the levels of 3150 to 3170. Broad range for the index is seen between 2880 to 3000 on downside & 3080 to 3100 on upside. Nifty METAL index closed the week on positive note gaining around 0.50%. As we have mentioned last week that minor resistance for the index lies in the zone of 3110 to 3120. Resistance for the index lies in the zone of 3150 to 3180 from where the index broke down on intraday basis. If the index manages to close above these levels then the index can move to the levels of 3220 to 3250. During the week the index manages to hit a high of 3158 and close the week around the levels of 3111. Minor support for the index lies in the zone of 3060 to 3080. Support for the index lies in the zone of 2990 to 3020 where bottom for the month of February-2017 is lying. 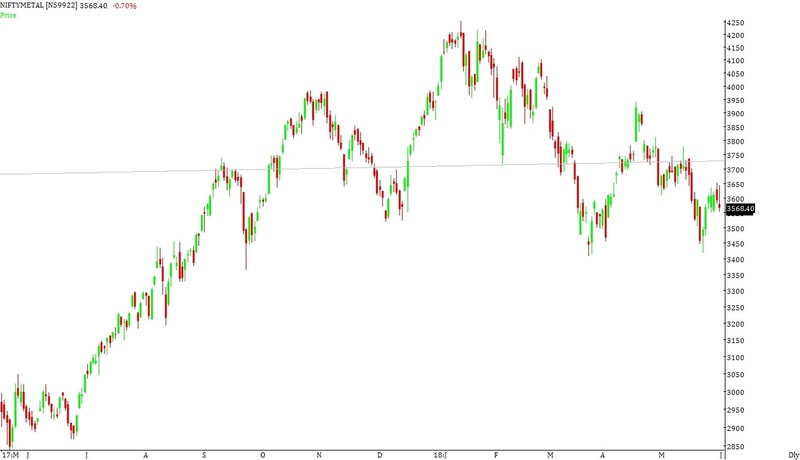 If the index manages to close below these levels then the index can drift to the levels of 2890 to 2910 from where the index broke out from November-2016 and December-2016 highs. Minor resistance for the index lies in the zone of 3110 to 3120. Resistance for the index lies in the zone of 3150 to 3180 from where the index broke down on intraday basis. If the index manages to close above these levels then the index can move to the levels of 3220 to 3250. Broad range for the index is seen between 3000 to 3030 on downside & 3170 to 3200 on upside. As we have mentioned last week that minor support for the index lies in the zone of 3080 to 3100. Support for the index lies in the zone of 2990 to 3020 where bottom for the month of February-2017 is lying. 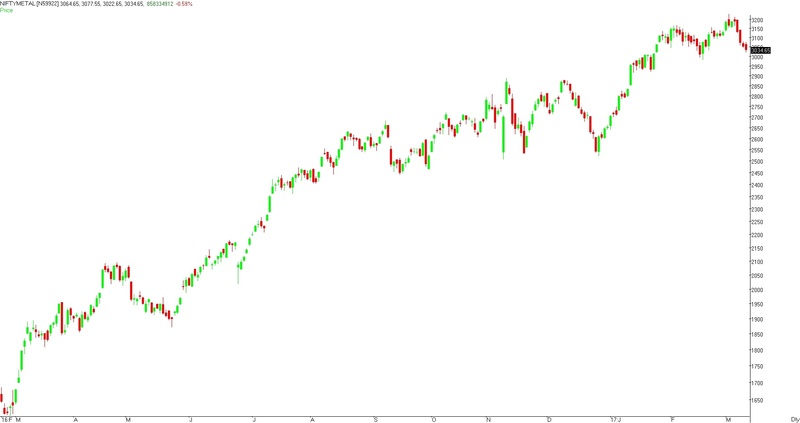 If the index manages to close below these levels then the index can drift to the levels of 2890 to 2910 from where the index broke out from November-2016 and December-2016 highs. During the week the index manages to hit a low of 3035 and close the week around the levels of 3097. Minor support for the index lies in the zone of 3050 to 3060. Support for the index lies in the zone of 2990 to 3020 where bottom for the month of February-2017 is lying. 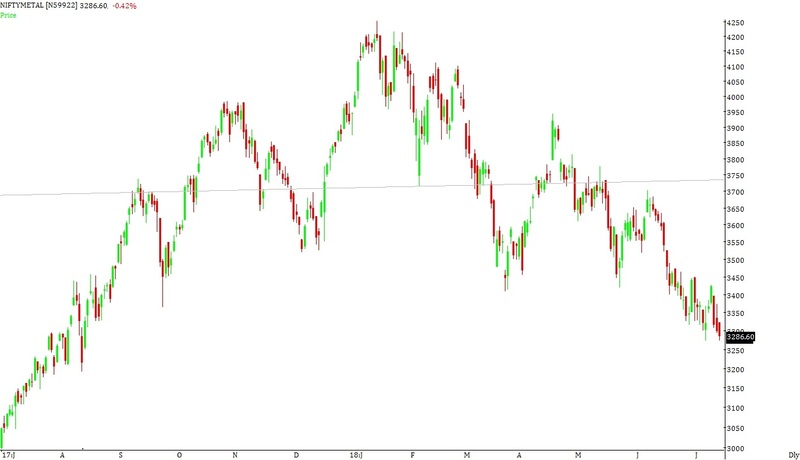 If the index manages to close below these levels then the index can drift to the levels of 2890 to 2910 from where the index broke out from November-2016 and December-2016 highs. As we have mentioned last week that resistance for the index lies in the zone of 3150 to 3180 from where the index broke down on intraday basis. If the index manages to close above these levels then the index can move to the levels of 3220 to 3250. During the week the index manages to hit a high of 3145 and close the week around the levels of 3123. Minor support for the index lies in the zone of 3080 to 3100. Support for the index lies in the zone of 2990 to 3020 where bottom for the month of February-2017 is lying. 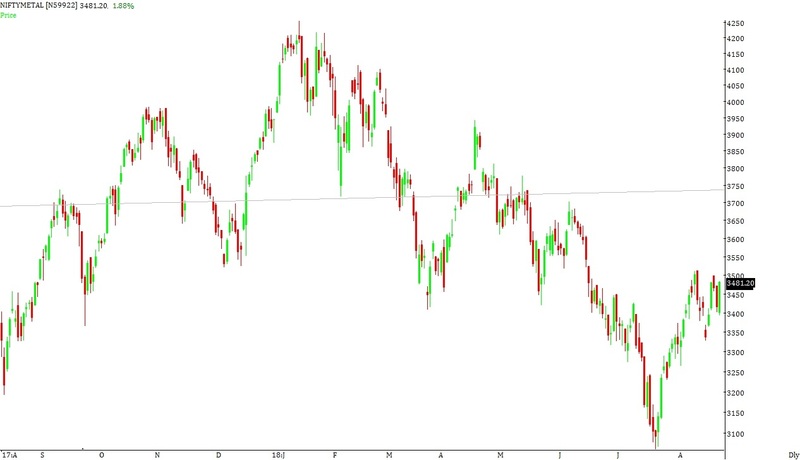 If the index manages to close below these levels then the index can drift to the levels of 2890 to 2910 from where the index broke out from November-2016 and December-2016 highs. Resistance for the index lies in the zone of 3150 to 3180 from where the index broke down on intraday basis. If the index manages to close above these levels then the index can move to the levels of 3220 to 3250. 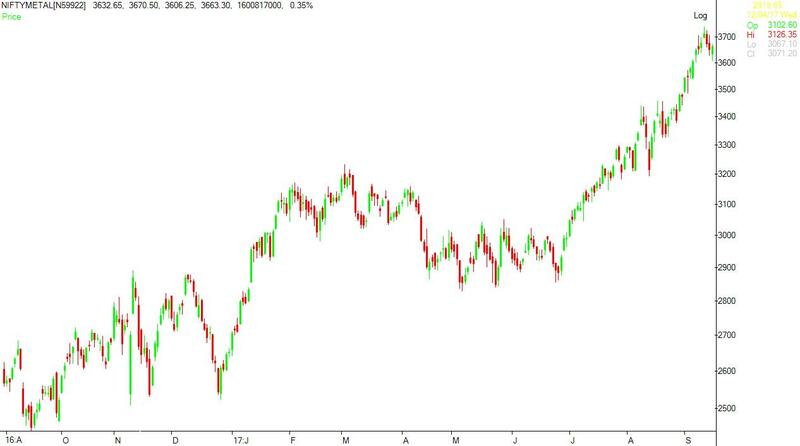 Broad range for the index is seen between 3000 to 3030 on downside & 3220 to 3250 on upside. Nifty METAL index closed the week on positive note gaining around 3.10%. As we have mentioned last week that support for the index lies in the zone of 2980 to 3000 where short term moving averages and bottom for the month of February-2017 is lying. 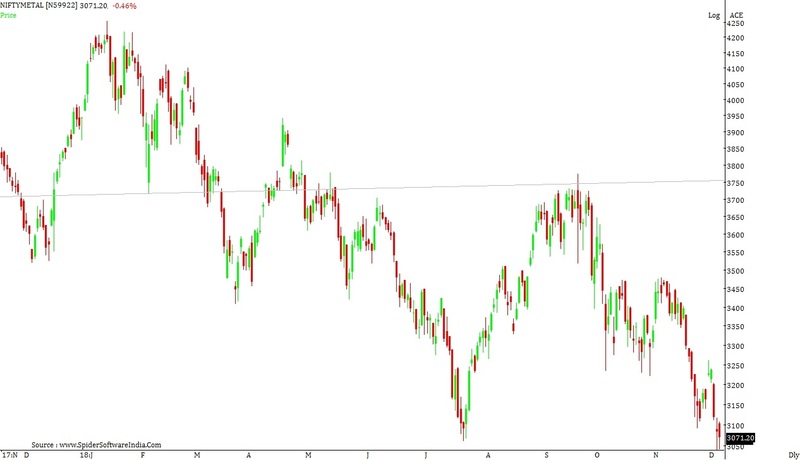 If the index manages to close below these levels then the index can drift to the levels of 2890 to 2910 from where the index broke out from November-2016 and December-2016 highs. During the week the index manages to hit a low of 3022 and close the week around the levels of 3127. Minor support for the index lies in the zone of 3080 to 3100. Support for the index lies in the zone of 2990 to 3020 where short term moving averages and bottom for the month of February-2017 is lying. 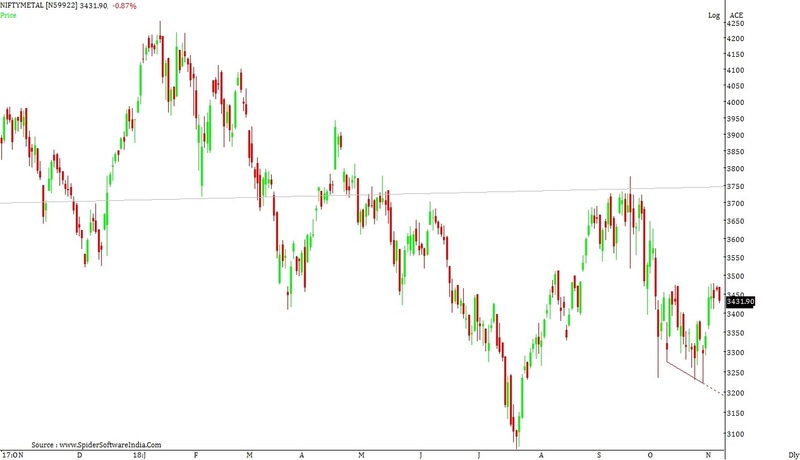 If the index manages to close below these levels then the index can drift to the levels of 2890 to 2910 from where the index broke out from November-2016 and December-2016 highs. Nifty METAL index closed the week on negative note losing around 4.80%. As we have mentioned last week that minor support for the index lies in the zone of 3140 to 3160. Support for the index lies in the zone of 3080 to 3100 where the index has taken multiple support. If the index manages to close below these levels then the index can drift to the levels of 2950 to 3000 where short term moving averages and bottom for the month of February-2017 is lying. During the week the index manages to hit a low of 3023 and close the week around the levels of 3035. Support for the index lies in the zone of 2980 to 3000 where short term moving averages and bottom for the month of February-2017 is lying. 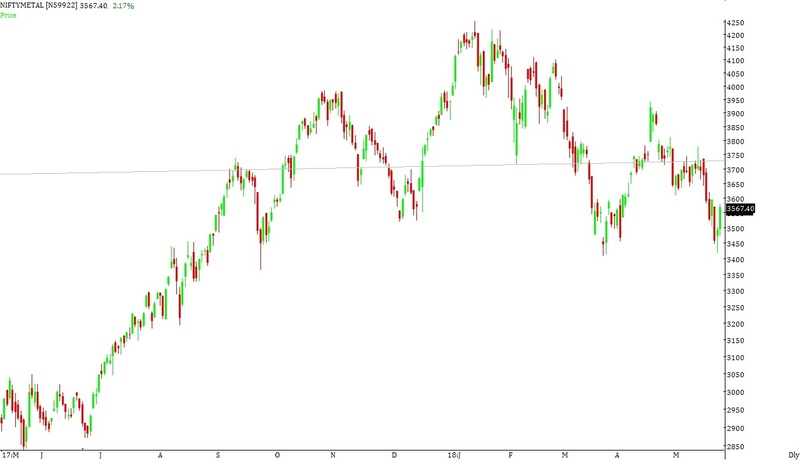 If the index manages to close below these levels then the index can drift to the levels of 2890 to 2910 from where the index broke out from November-2016 and December-2016 highs. Minor resistance for the index lies in the zone of 3090 to 3110. Resistance for the index lies in the zone of 3150 to 3180 from where the index broke down on intraday basis. If the index manages to close above these levels then the index can move to the levels of 3220 to 3250. As we have mentioned last week that resistance for the index lies in the zone of 3150 to 3170. Resistance for the index lies in the zone of 3330 to 3370 from where the index sold off in the month of August-2014. If the index manages to close above these levels then the index can move to the levels of 3500 to 3550 where the index has formed a top in the month of June-2014. During the week the index manages to hit a high of 3234 and close the week around the levels of 3187. Minor support for the index lies in the zone of 3140 to 3160. Support for the index lies in the zone of 3080 to 3100 where the index has taken multiple support. If the index manages to close below these levels then the index can drift to the levels of 2950 to 3000 where short term moving averages and bottom for the month of February-2017 is lying. Minor resistance for the index lies in the zone of 3240 to 3260. Resistance for the index lies in the zone of 3330 to 3370 from where the index sold off in the month of August-2014. If the index manages to close above these levels then the index can move to the levels of 3500 to 3550 where the index has formed a top in the month of June-2014. As we have mentioned last week that minor support for the index lies in the zone of 3000 to 3050. 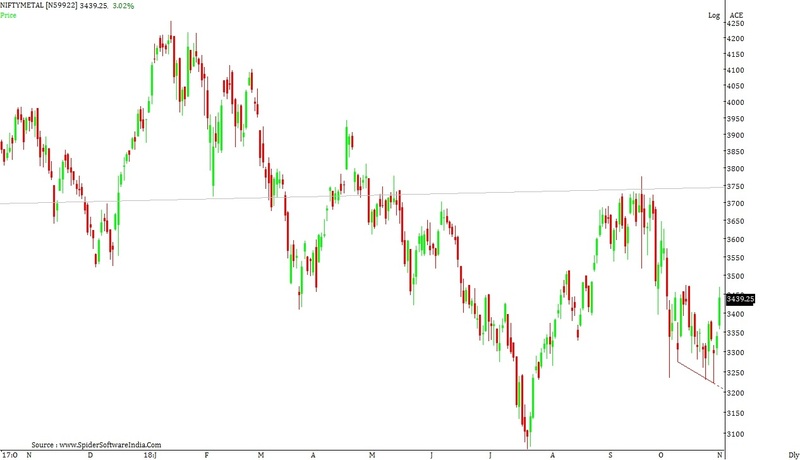 Support for the index lies in the zone of 2850 to 2900 from where the index broke out from double top pattern. If the index manages to close below these levels then the index can drift to the levels of 2750 to 2775 where medium term moving averages and Fibonacci levels are lying. During the week the index manages to hit a low of 3034 and close the week around the levels of 3120. Minor support for the index lies in the zone of 3050 to 3080. 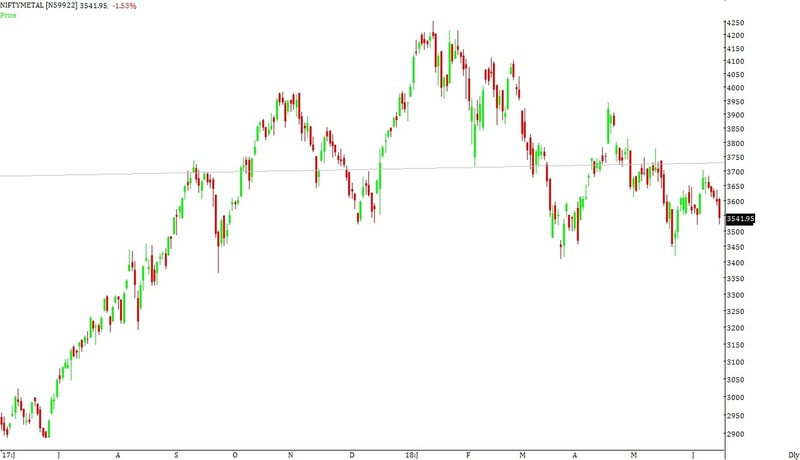 Support for the index lies in the zone of 2950 to 2980 where the index has formed a short term bottom. 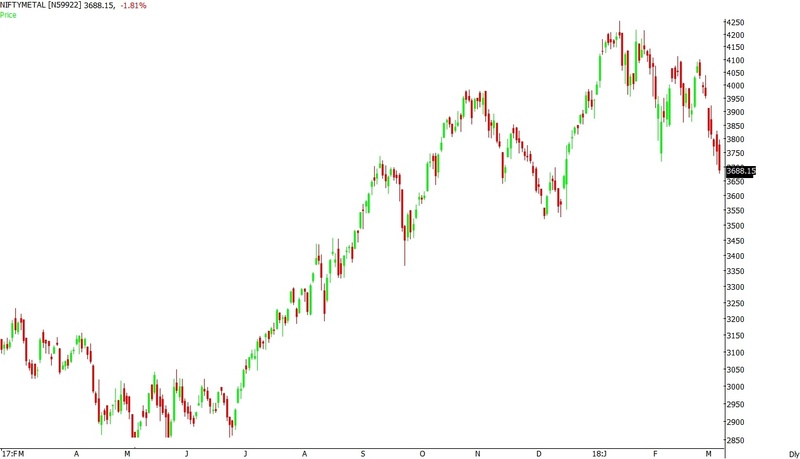 If the index manages to close below these levels then the index can drift to the levels of 2850 to 2900 from where the index broke out from double top pattern. Resistance for the index lies in the zone of 3150 to 3170. Resistance for the index lies in the zone of 3330 to 3370 from where the index sold off in the month of August-2014. If the index manages to close above these levels then the index can move to the levels of 3500 to 3550 where the index has formed a top in the month of June-2014. As we have mentioned last week that minor resistance for the index lies in the zone of 3100 to 3120. Resistance for the index lies in the zone of 3180 to 3200. Resistance for the index lies in the zone of 3330 to 3370 from where the index sold off in the month of August-2014. If the index manages to close above these levels then the index can move to the levels of 3500 to 3550 where the index has formed a top in the month of June-2014. During the week the index manages to hit a high of 3116 and close the week around the levels of 3054. Minor support for the index lies in the zone of 3000 to 3050. 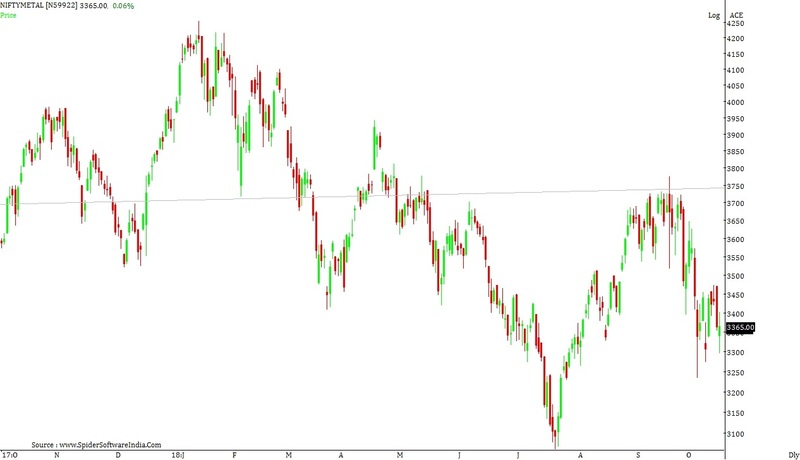 Support for the index lies in the zone of 2850 to 2900 from where the index broke out from double top pattern. If the index manages to close below these levels then the index can drift to the levels of 2750 to 2775 where medium term moving averages and Fibonacci levels are lying. Minor resistance for the index lies in the zone of 3100 to 3120. Resistance for the index lies in the zone of 3180 to 3200. Resistance for the index lies in the zone of 3330 to 3370 from where the index sold off in the month of August-2014. If the index manages to close above these levels then the index can move to the levels of 3500 to 3550 where the index has formed a top in the month of June-2014. Broad range for the index is seen between 2930 to 2950 on downside & 3120 to 3150 on upside.